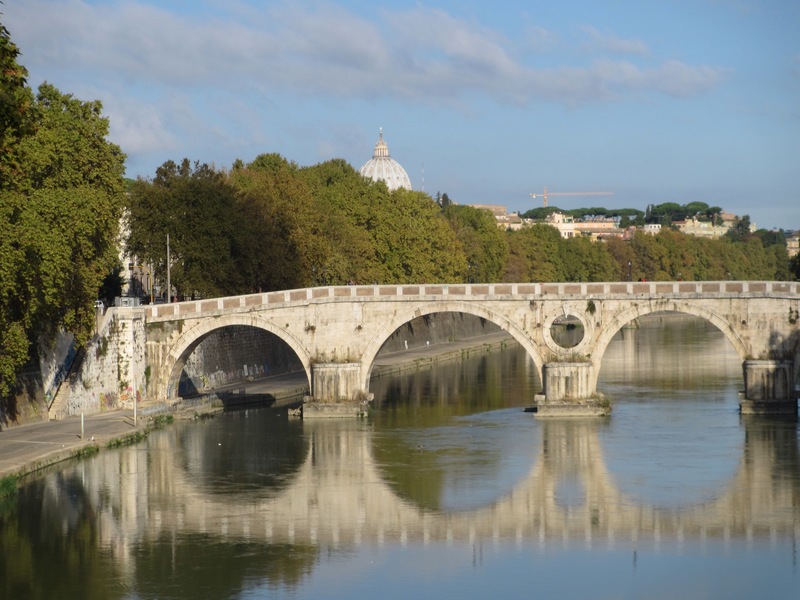 The day was ideal for an early morning walk along the Tiber to get to St Peter’s Square. We set off early as we hoped to be able to get to the special celebration for the elderly(!) which was scheduled for 28th September. We were very surprised to be able to get seats in the main area of the Square. By the time Mass started the Square was packed. Apparently the Square holds approximately 80,000 people and it seemed it was full to capacity. Due to the very good organisation ( it reminded me of Graduation Day) it managed to be both intimate and moving, which we all thought was an extraordinary achievement. 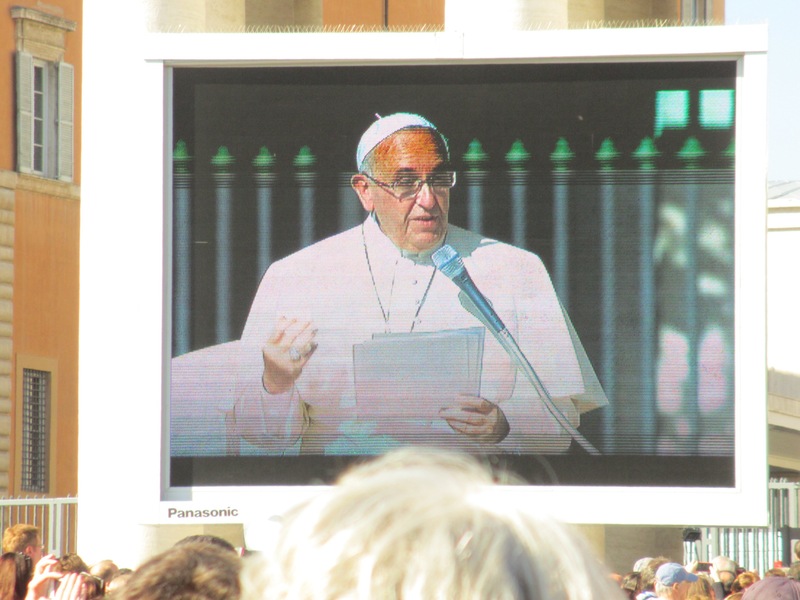 The excellent audio visual systems helped enormously, and Pope Francis seemed relaxed and engaged with the invited guests, both young and very old, who had come from around the world. 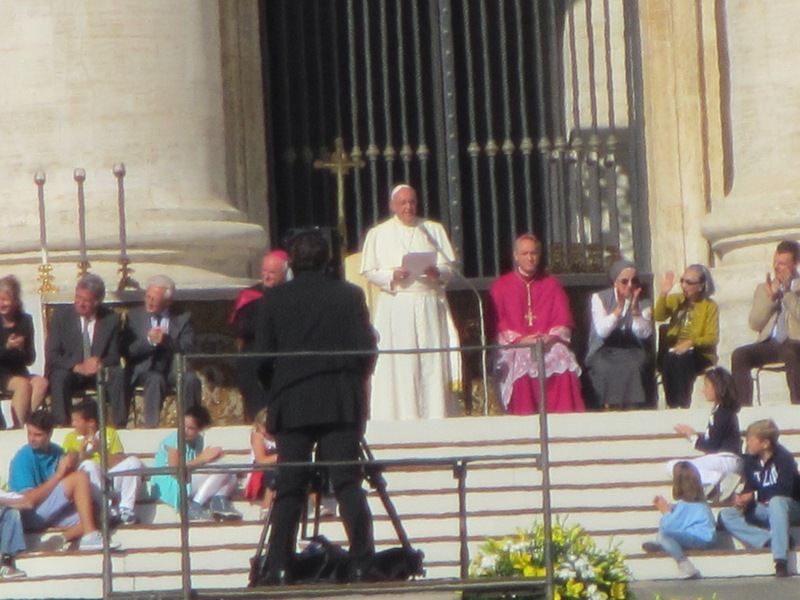 After the ceremony the Pope did a tour of the Square and it seemed he was being teleported by some mystical force. It turned out it was some sort of low-loader vehicle to enable him to get around this vast space quickly. He clearly enjoyed the ride! 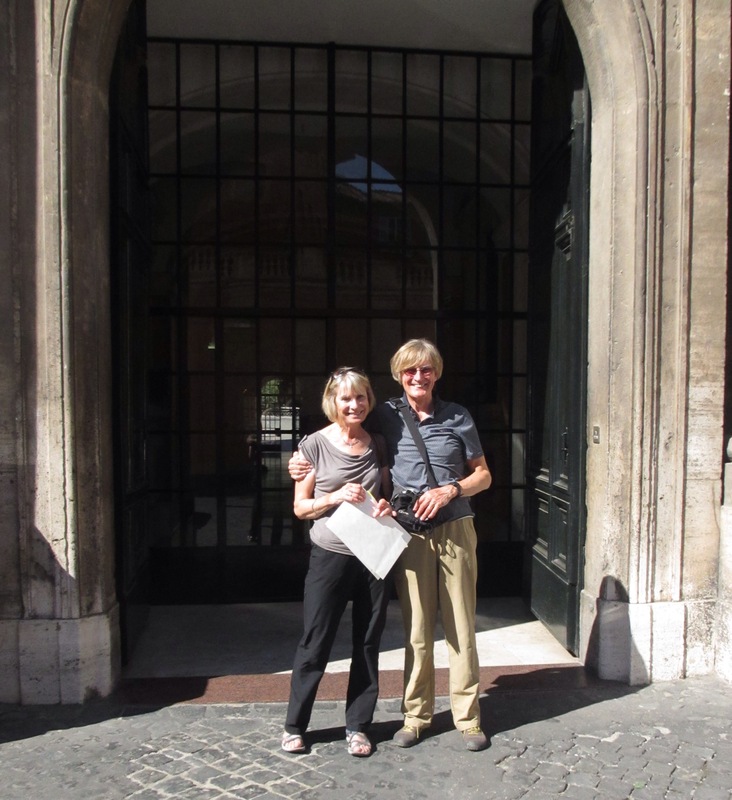 The rest of the day was taken up with being tourists, but on Monday we returned to the Vatican to present our passports. Interestingly, in comparison to the access to the Mass the day before, the security was very tight. 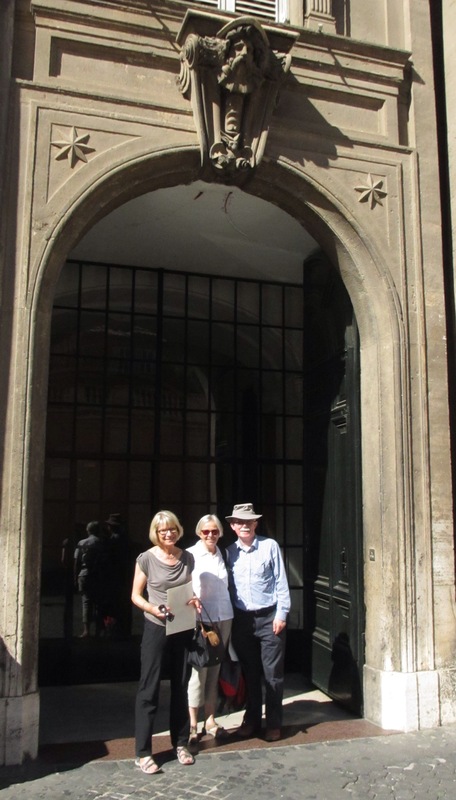 First, we had to get past the Swiss Guard, then we were scanned by the Carabinieri and finally we had to submit our UK passports to Security before we could be admitted to the inner sanctum of the Vatican. Shortly after we emerged with our Testimoniums ( or is it Testimonia?). We had one more thing to do, but before that we thought it best to tackle our bikes. The search was on for pipe insulation to protect the frames when they get into the hands of the airline baggage handlers. We separated from Roy and Sarah so that we could explore the nether world of Roman Ferramentas. It proved to be a pilgrimage in itself. Much mirth ensued when we purchased 8 metres of black foam pipe lagging and wrestled it back to our B&B. The bikes were finally taken apart ( at least enough to satisfy the airline regulations), and transferred from our underground parking to our bedroom. The B&B owner doesn’t seem to mind. On Tuesday we set out to achieve one final act. We had wanted to light a candle in Rome in memory of Katherine but we found ourselves frustrated in St Peter’s Basilica as all the “candles” are electric. 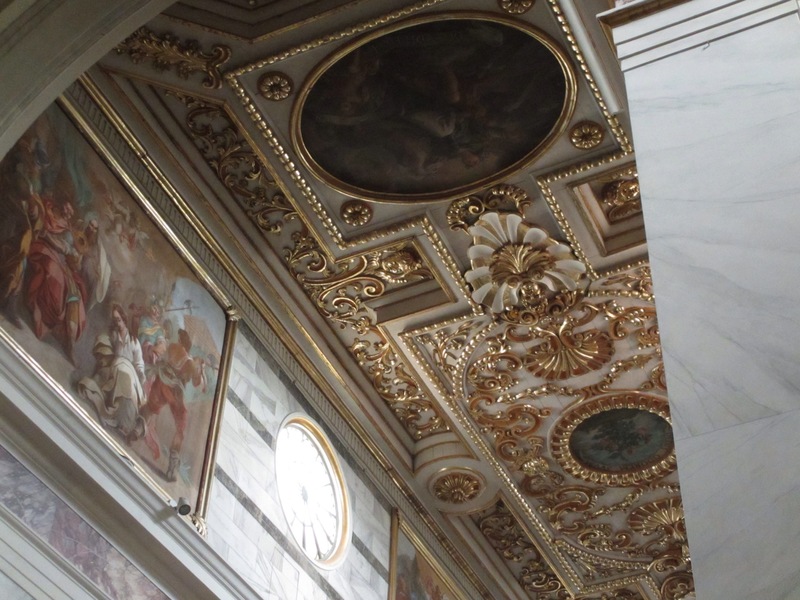 We also found that the church, whilst culturally and artistically stunning, felt more like a museum or art gallery than a place of reflection. 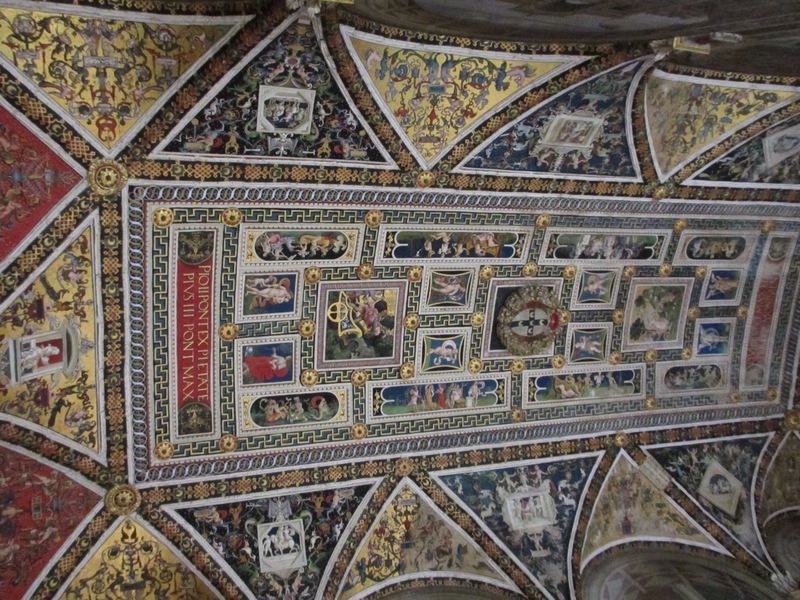 The same applied to our second choice, the ancient pilgrim church of St John Lateran which I had naively thought would be a place of great spiritual atmosphere given its status as the first public place of worship in Christendom. Again, it is visually stunning but peace and solitude were at a premium. 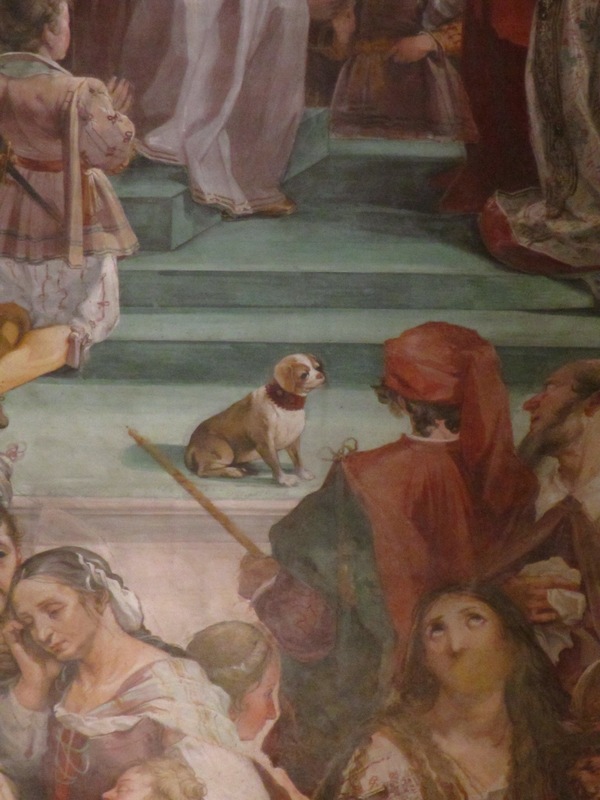 After much searching we found what we were seeking in Sant’ Andrea al Quirinale. It seemed appropriate that it should be in a church consecrated to Scotland’s patron saint that we could undertake our small act of commemoration. For the rest of our time in Rome we have done what most visitors do and tomorrow we return to Scotland. We feel immensely privileged to have had the opportunity to undertake this journey and to share it with you all. As we have said before we are very grateful for all your support, encouragement and, above all, generosity in supporting the Strathcarron Hospice. It had now become the norm for the sun to be splitting the sky as we set off for the final stage of our 32 stage journey to Rome. 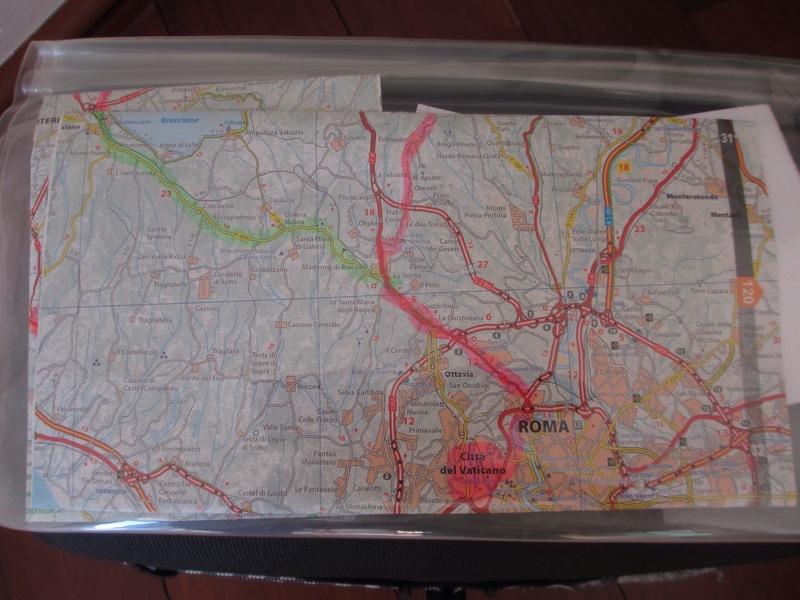 My final map – torn from a Michelin road atlas of Italy – said it all. I had used such sheets all the way from Calais so as to have an overview when using the more detailed plot of our route on the handlebar GPS. The green highlight was our cross-country route from Bracciano to La Storta and the pink was the final section along the very busy Via Cassia. We had hoped the road to La Storta would be quiet. It was anything but! The surface was even worse than usual and it seemed that the entire lakeside population around the Lago was going to Rome for Saturday shopping. It was a very trying ride with me, on occasion, having to take the crown of the road and delay the traffic to avoid the wheel buckling potholes along the right-hand edge. We arrived at La Storta in some state of dread as to the riding on the much busier Via Cassia. As it turned out our fears were unfounded. The road was so busy the traffic was at a crawl to near standstill, often enabling us to pass cars quietly on the inside. 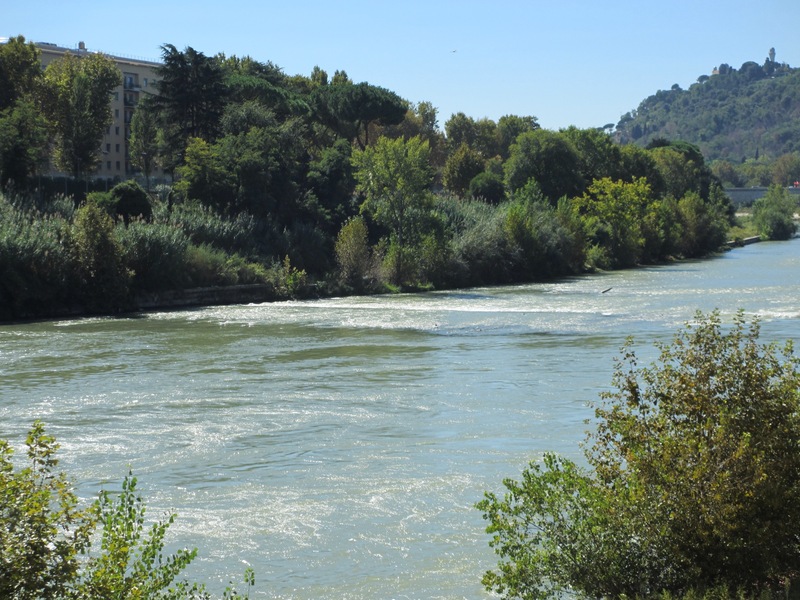 After a long and steep descent it was obvious we were approaching the River Tiber. I paused to check my plot as I was concerned the planned route appeared to be taking us into a suburban motorway system. A small road to the right indicated it led to a bridge, and so we dropped down and were greeted with a miraculous sight: a cycle path along the river! I hope the two photos convey the contrast between the bustle of the city roads and the tranquillity of the riding along the river. 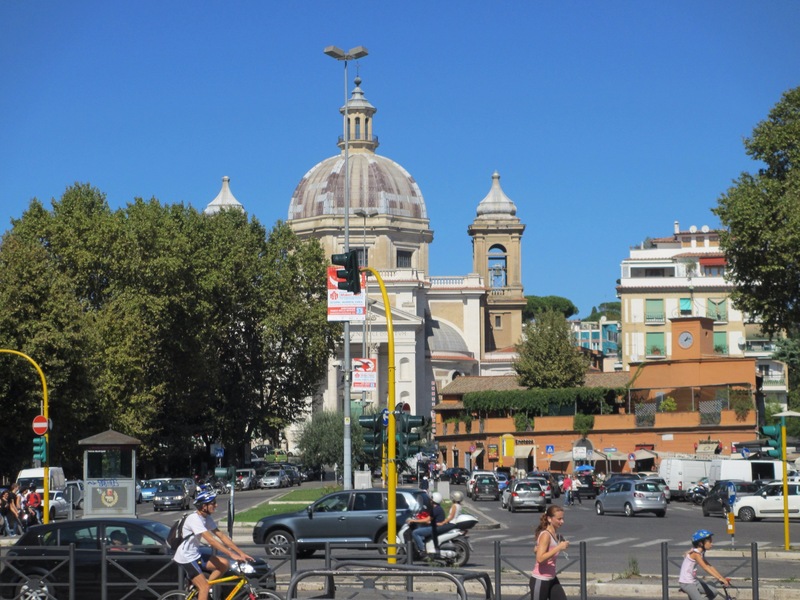 After we had passed several bridges the dome of St Peter’s came into view and we knew it was time to leave the cycle track. 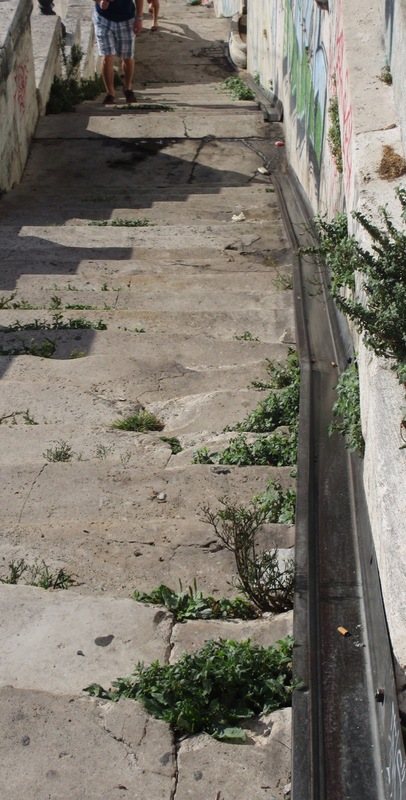 However, by this time we were a long way below street level and the access to the road was up very steep steps. I cycled a couple of bridges and found a shallower rake. We unloaded each bike, ferried the bags to the top of the steps and then pushed the bikes up the steps. Fortunately they had a steel gutter at the edge which facilitated the wheeling. 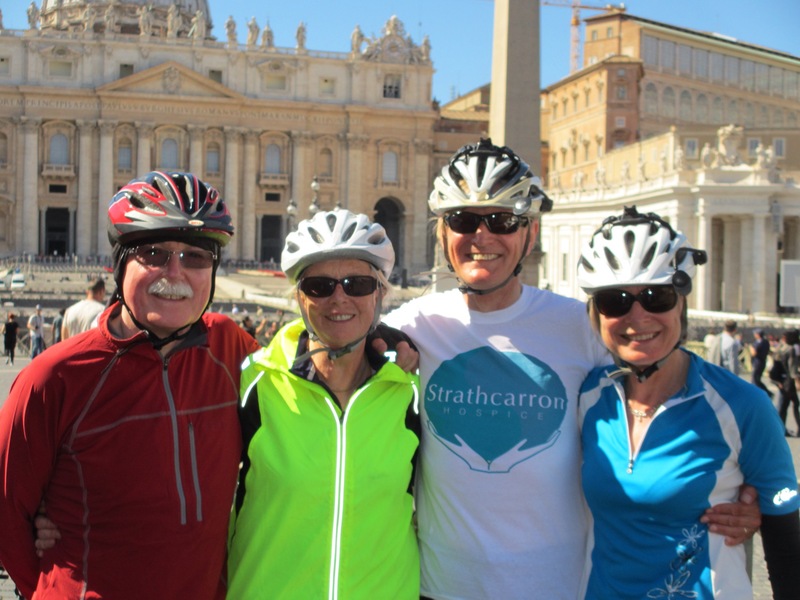 There were about eighty steps and so it was a group of tired cyclists who pushed their bikes into the Vatican. It is hard to convey the depth of emotion we all felt as we entered St Peter’s Square. None of us had been there before, and each of us was deeply affected by the moment. Linda and I took out our t-shirts from Strathcarron Hospice and Roy took the photo. 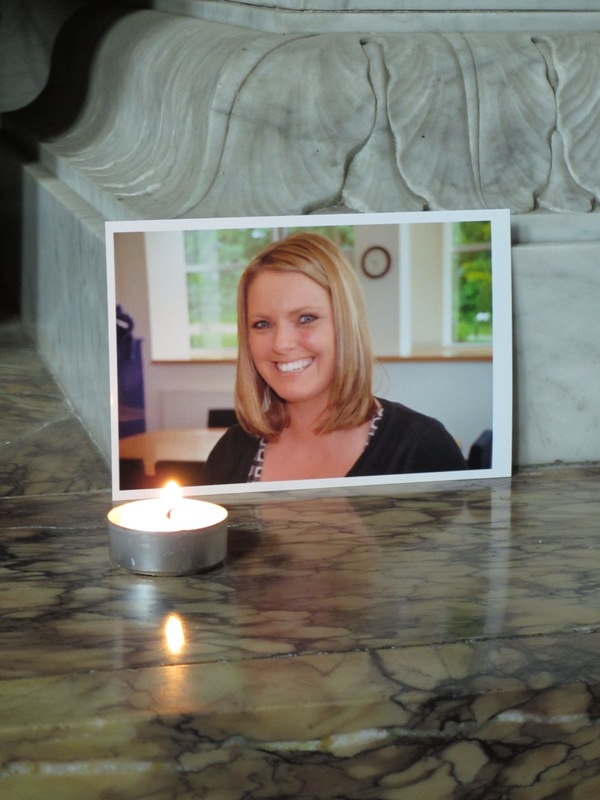 We were remembering Katherine and all that the Hospice had done for her in her last days. We felt very blessed indeed that we had been given the gift of good health to enable us to take on this journey. Alhough we were stunned by the crowds people were very friendly and a young American couple kindly offered to take a photo of the Better Together team. 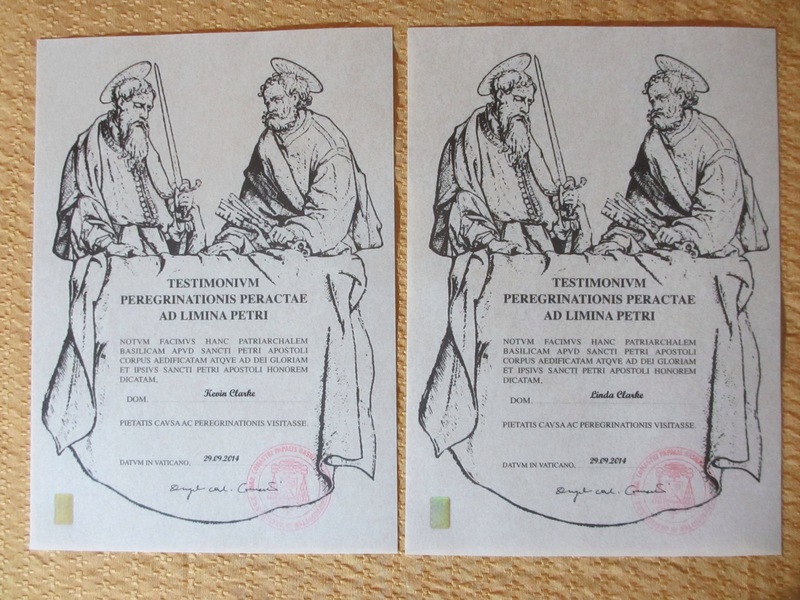 We decided we would leave it to Sunday before returning to St Peter’s as we hoped to attend Mass there. We wheeled the bikes once more across the cobbles, found some lunch and eventually, after four more miles of Roman traffic, our B&B near the inner area of Trastevere. Our bikes were carefully placed in a secure garage nearby, and our next task is to dismantle them for the return flight home. 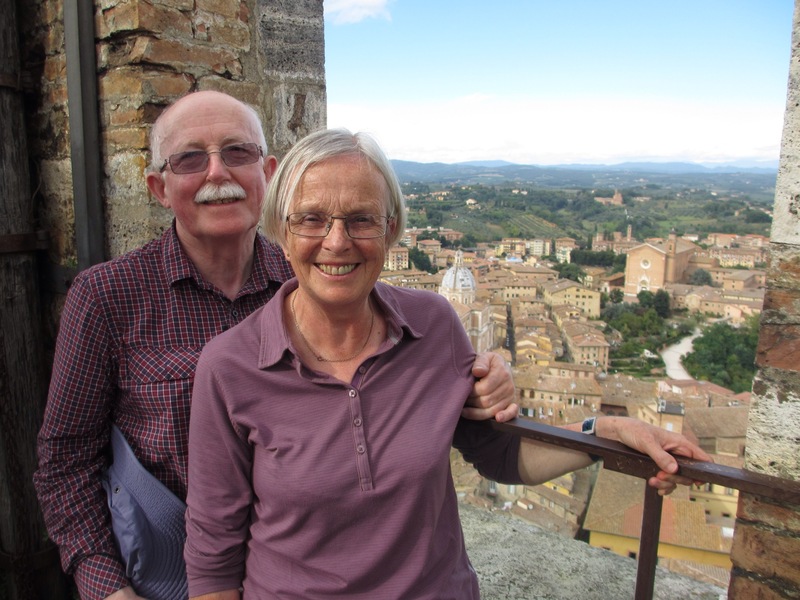 Our friends, Tim and Carol, who are fellow cycle tourists and whom we met for the first time on the ferry quay at St Malo last year, summed up our thoughts in a recent comment on the blog. 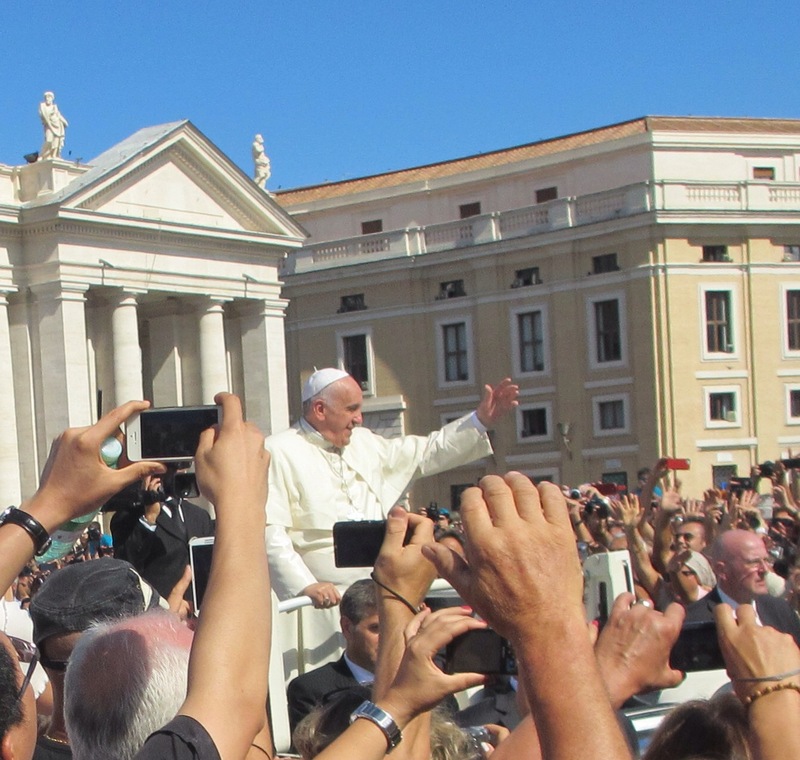 We discovered from the internet that there is to be a major celebration for grandparents and the elderly tomorrow at an open air Mass in St Peter’s Square. We were too late to get the free tickets which they distribute for such occasions but we hope to get up early (once more) and see if we can, at least, join those standing for the celebration. We therefore hope to post a short epilogue to the story. We will end once again with our heartfelt thanks to you all for your support and encouragement. We have felt hugely privileged. If you can all bear it we hope to make a final post before we leave. 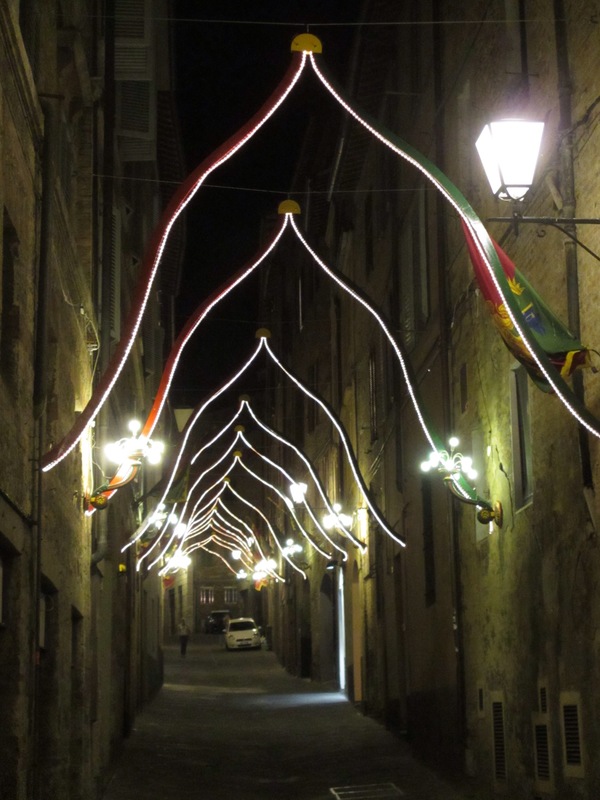 On Thursday evening we had walked to our restaurant in Viterbo in the rain. It was the culmination of several days of uncertain weather from which we had escaped largely unscathed, apart from the Scottish moment at Radicofani. Friday morning resolved all weather concerns. It was clear, cool and with crystalline air. We left Viterbo’s walls via St Peter’s gate; it seemed appropriate. Once again the route proved to be remarkably hilly with constant gain and loss of height with summits lying around the 500 metre mark. We had plotted a quiet route to get us off the main road and it was very empty and rural. 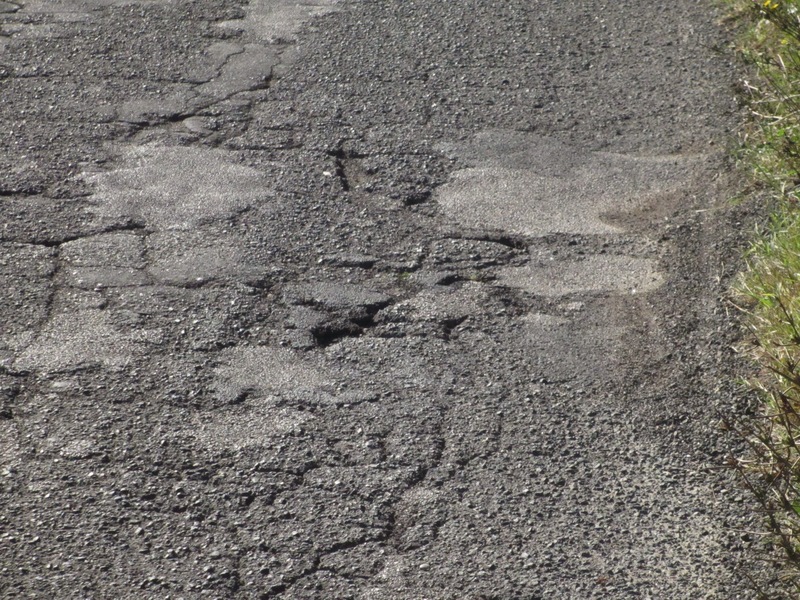 The roads remained a challenge because of their terrible surface quality. We may have touched on this before, but it is fair to say we had become thoroughly weary of the consistently awful quality of the roads in Italy even when compared to our local roads in Stirling. 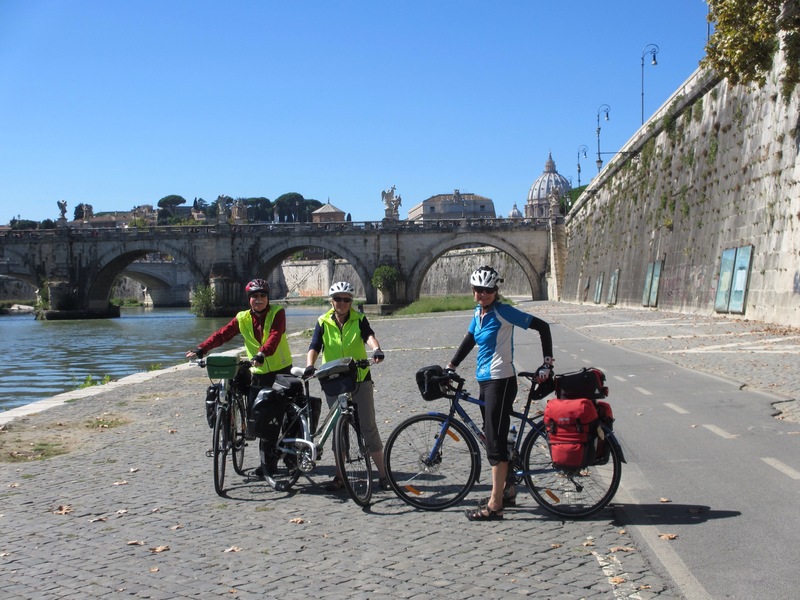 We had now cycled for almost 600 miles in Italy and we estimated we had had fewer than 20 miles of reasonable surface. This not only made the riding uncomfortable and tense because of the risk to the bikes, but more importantly we were constantly moving to the crown of the road to avoid being brought off by very large holes or longitudinal ruts. This increased the risk of a collision with following traffic. Enough of my diatribe as today we experienced a different hazard. As we neared Vetralla, in the middle of nowhere, two small dogs were lying in wait for any unsuspecting cycling pilgrims…..and they hit the jackpot! They came at my front wheel from nowhere. Given our experience on the Camino I carry a ‘dog dazer’ on my handlebars which emits a very loud ultrasonic noise. As the first dog tried to bite my ankles I managed to get to the trigger which gave enough respite for me to turn the bike around and cycle directly at the dogs. Linda, Roy and Sarah were highly amused as this manic figure, astride his bike, was charging the dogs bellowing like a warlord and zapping them with the ‘silent’ device. Sarah said she didn’t know I could shout that loud. Something worked though as the dogs put their tails between their legs and skulked away! 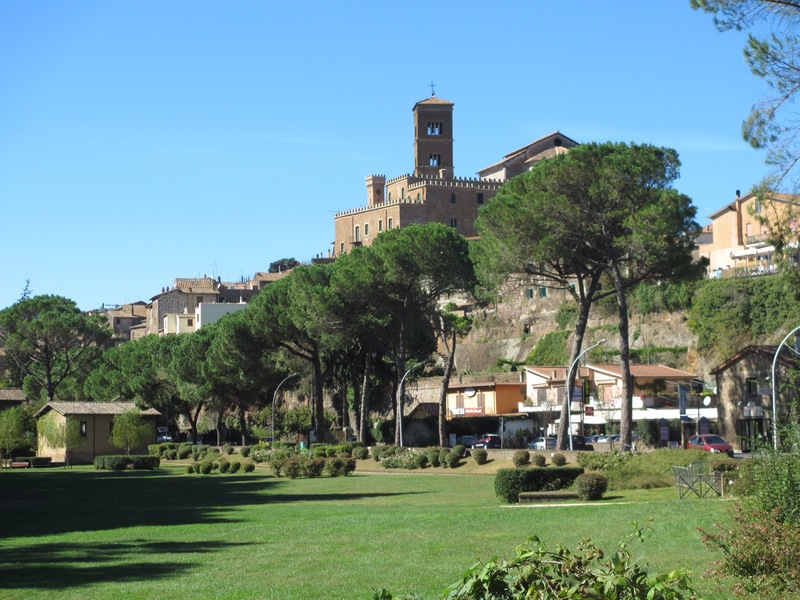 After a quick coffee in Vetralla we headed to Sutri for lunch. It is in a shallow gorge of tufa stone and is famous not only for its wonderful mediaeval streets but also its ancient amphitheatre which is carved out of the soft stone. 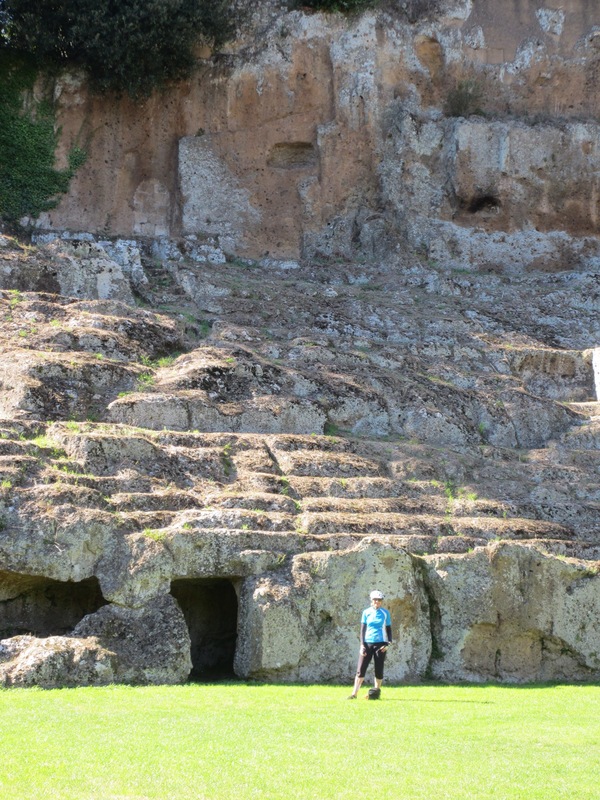 The amphitheatre is huge as is evident set against Linda, but one can also see the terracing and the tunnels used by those ‘performing’ in the amphitheatre. 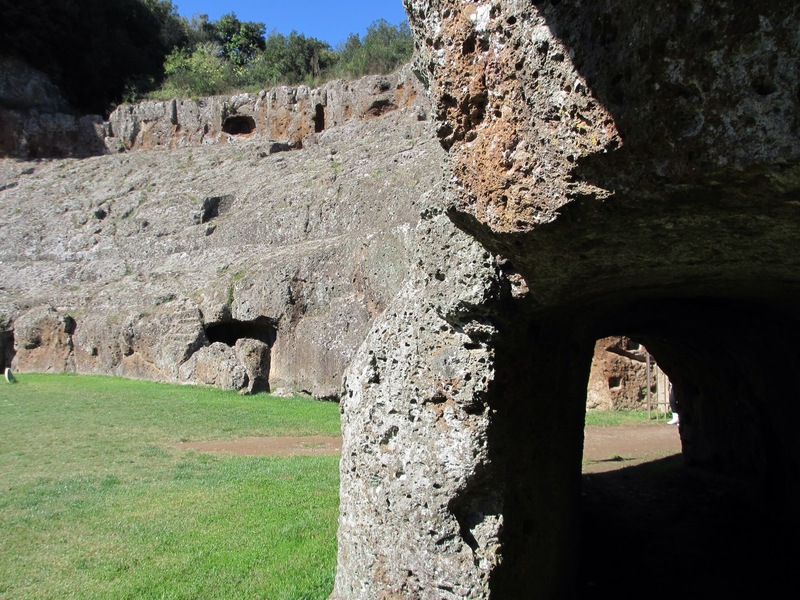 We left this fascinating remains to embark upon the last major climb of the day, again created by the crater of a dormant volcano in which is nestled the lovely Lago di Bracciano. Near the top of the climb we saw the final province sign to warm our hearts. The climb was in the full heat of the day but we quickly cooled off on the long descent to the lake side. 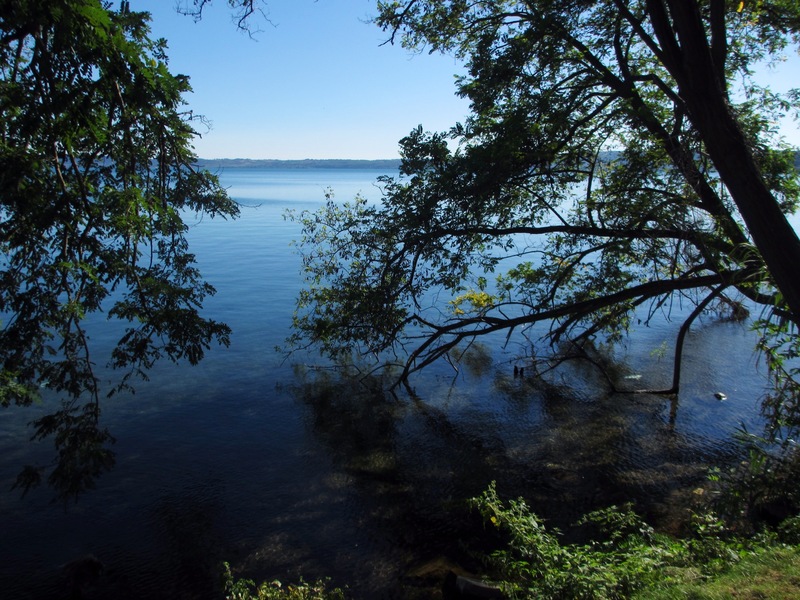 The Lago is very tranquil with superbly clear water. 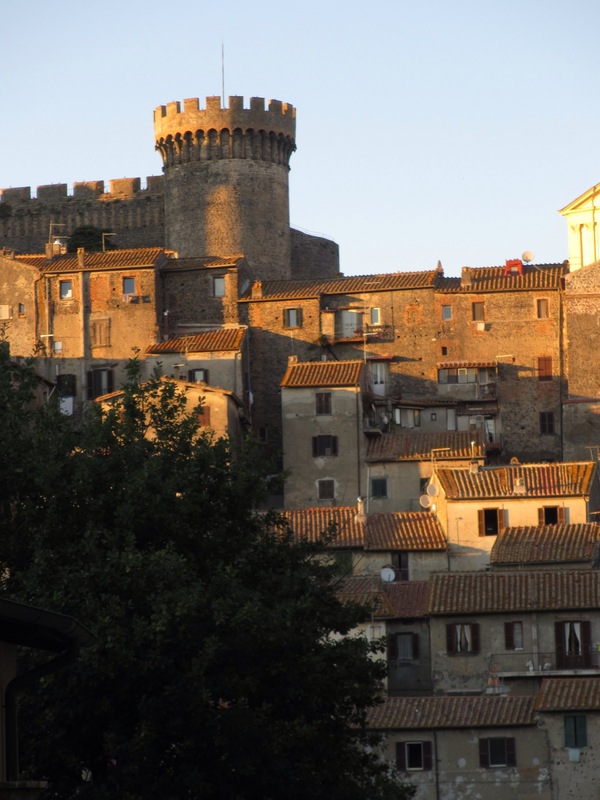 The small town of Bracciano stands high above the lake and is, once again, a maze of narrow mediaeval streets. We were desperately trying to find the right lane to our B&B when a Volkswagen Beetle pulled up bringing the busy traffic to a complete standstill and the driver asked if we were looking for the B&B! It turned out that she was the owner and of course knew her guests were due to arrive by bicycle. She suggested we follow her! We managed to keep up – it was downhill after all. Suffice to say it was stunning in every respect. The views as the sun set over the lake were magnificent. We walked up to the castle in the evening light to get a meal and we thought that perhaps we’d end our journey here in this idyllic setting. 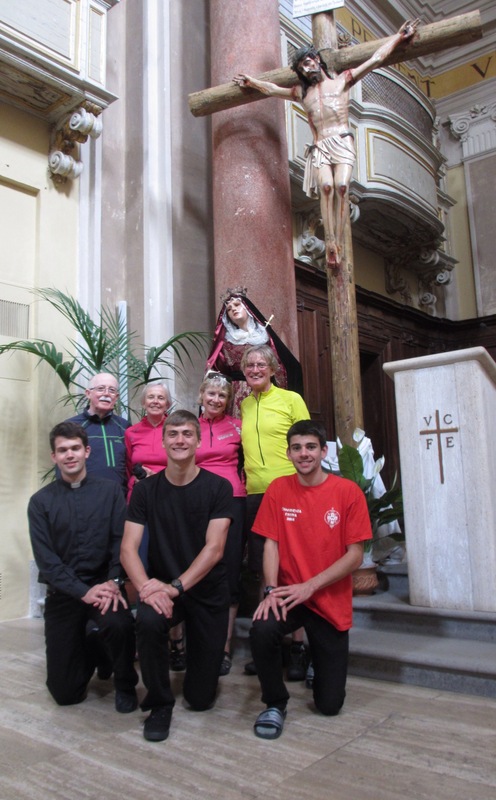 Unfortunately the life of the pilgrim is not supposed to be easy and so we committed ourselves to tackling the final 25 miles or so into Rome. We hope the traffic on Saturday is a little calmer than on Friday. Once again, before we give today’s account, I wish to thank those who have recently contributed so generously to our fundraising site. We find it hard to keep up with the cycling, the domestic chores at the end of each day……and the blogging – to fit in much in the way of emails individually. And so, thank you all again from the bottom of our hearts. It really has helped to keep us going. We also love the comments we have been getting, as well as the personal emails from those who,for some technical reason or other, have found it hard to put comments directly onto the blog. They really have made us feel very much in touch, and they have cheered us up and helped get us back on the bikes day after day. Thank you all. And finally, for Dot, we are expecting to see YOU in Bracciano on Saturday morning to join us on the final stage into Rome. 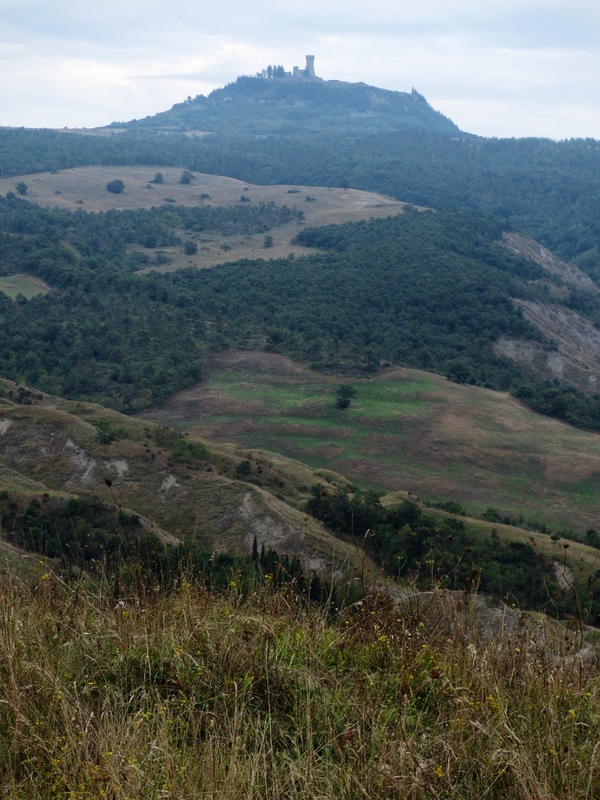 From the North Downs to the Seven Hills……..
Our climb from Acquapendente was needed to get over the edge of the old crater rim. 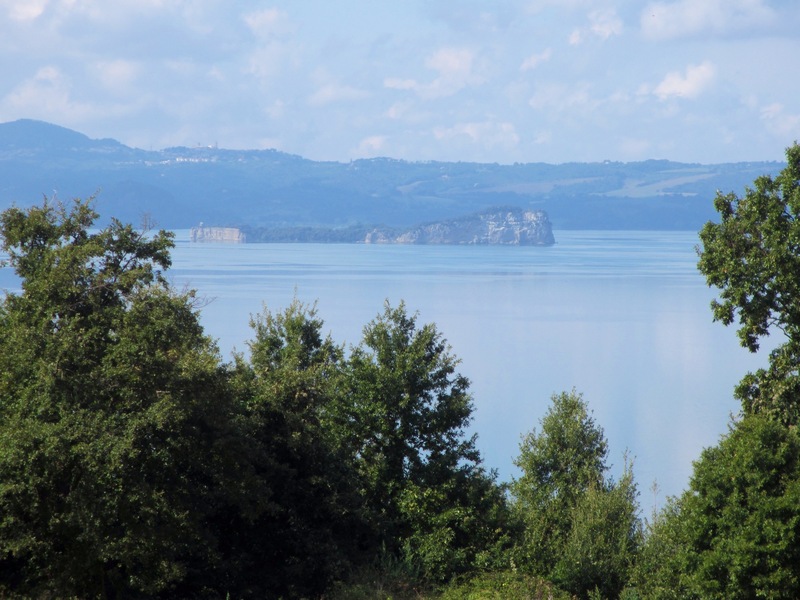 We then dropped quickly to the lago and worked our way through olive and nut groves to the lovely lakeside town of Bolsena. We continued along the shore of the lake with it being very evident that we were just inside the rim of the crater. The weather improved and the views of the lake also. 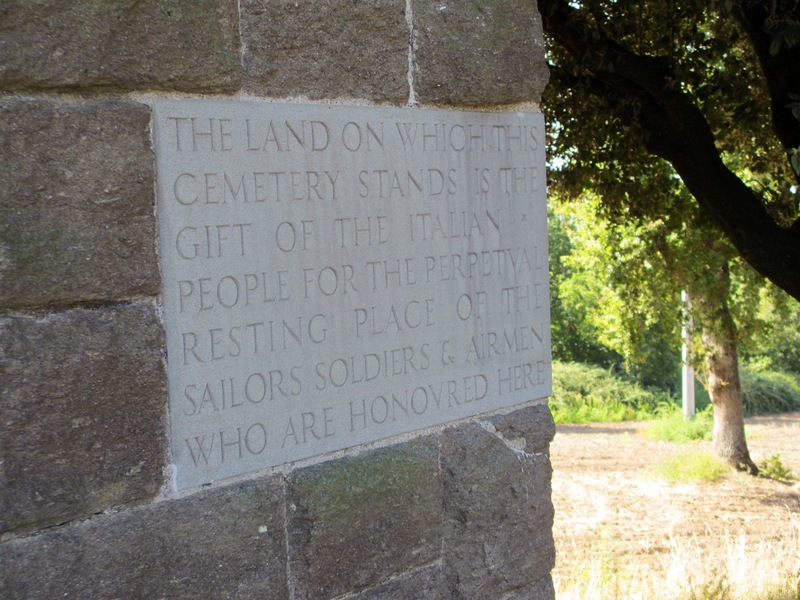 We had a surprising connection to the very early part of our ride in the form of a Commonwealth war grave right on the shores of the lake. It was a World War II memorial. Having cycled into the volcano we, of course, had to cycle back over the rim of the crater. 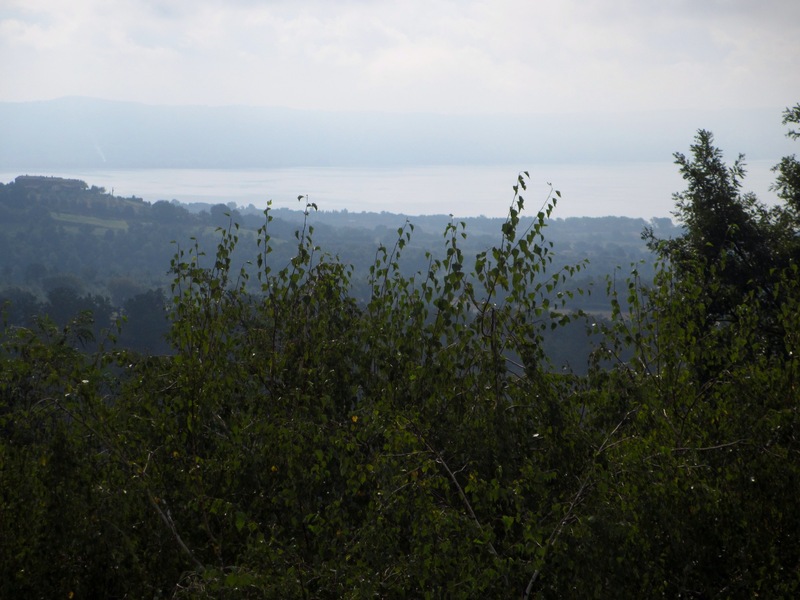 The highest point was at Montefiascone which was perched right on the rim. 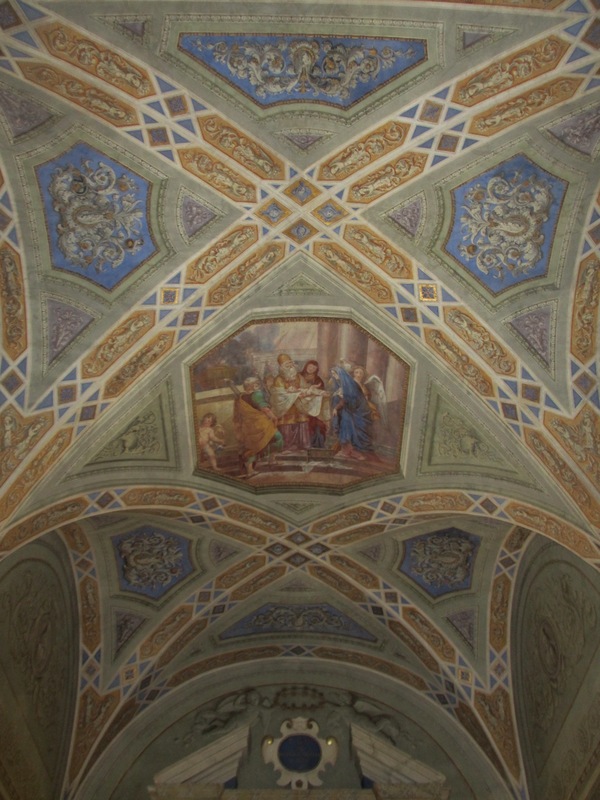 We were keen to visit Montefiascone as three young men from our parish in the Raploch in Stirling are based at the seminary there. We had seen Gerard shortly before we left Scotland and said we hoped to turn up on our bikes. 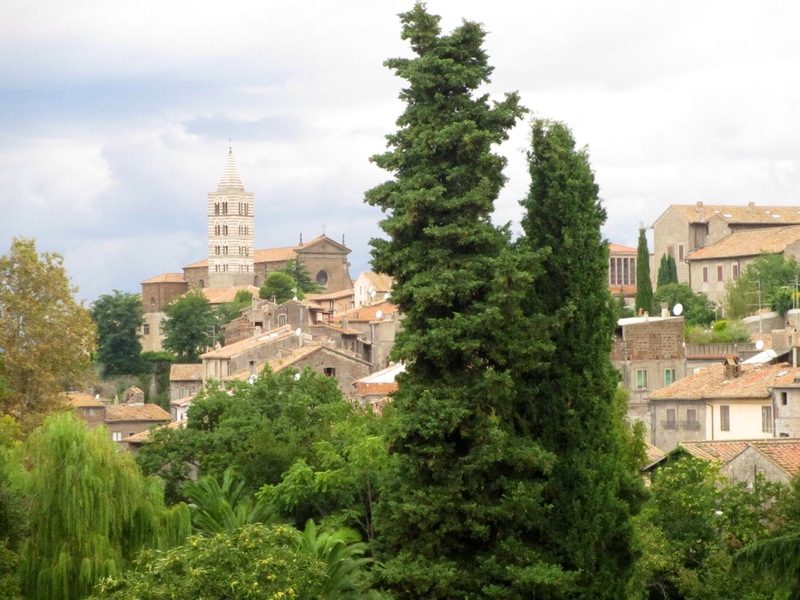 Having made the long haul of nearly an hour’s solid climbing we arrived at the old gate to this mediaeval city and were greeted by a slabbed road so steep we had no option but to get off and push. The local tourist office helped us identify the seminary and we found it situated at the very top of the hill. I entered the building with a degree of temerity, and was greeted by a young priest to whom I explained my unlikely story. His face lit up and he went immediately to the refectory ( it was lunchtime when we had arrived) and emerged with a beaming Gerard in tow. We were all welcomed most warmly and they insisted they give us all lunch. We were presented with bowls of pasta, fresh cooked meat casserole and a fresh fruit bowl and could not have been given a warmer or more generous welcome. Gerard, Simon and Dominic introduced us to many of their friends, and after lunch they showed us around. They were particularly, and rightly, proud of the church which the seminarians had helped to restore, and they suggested that we have a photo taken in the church. These three young men and their friends provided a highlight for us in this journey. Their faith and their kindness shone through. The whole visit was as uplifting as it was improbable. Certainly they found it slightly bewildering that we had turned up so far from our mutual homes by bicycle! Our farewells said we then returned to the road for the final stretch of the day to Viterbo. 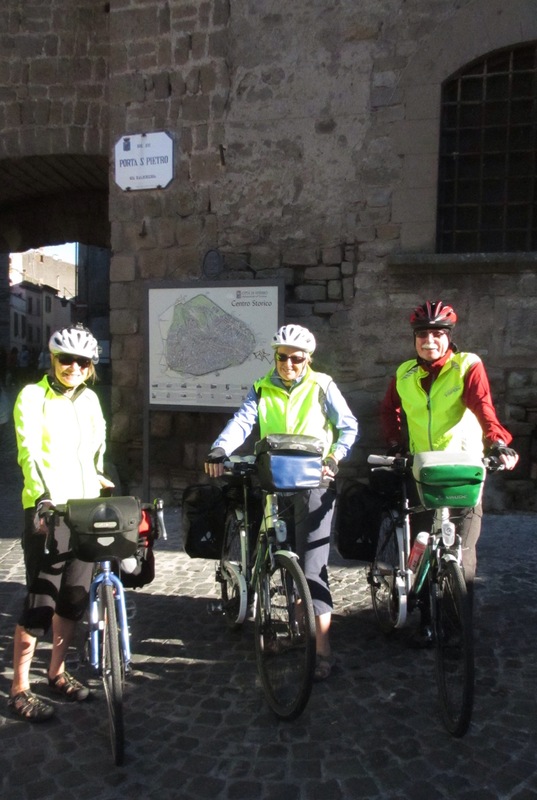 The country riding was largely delightful but Viterbo was a real challenge with a complex road network trying to negotiate an ancient mediaeval walled city. At one point a double articulated lorry forced me out of the lane into a wrong turning. Unfortunately for him the lights turned to red which gave me the opportunity to cycle directly in front of him and around to the driver’s side where I was able to let him know my opinion of his driving! Linda thought I might get taken out either by him or by one of the cars coming up the inside in the double-laned highway. 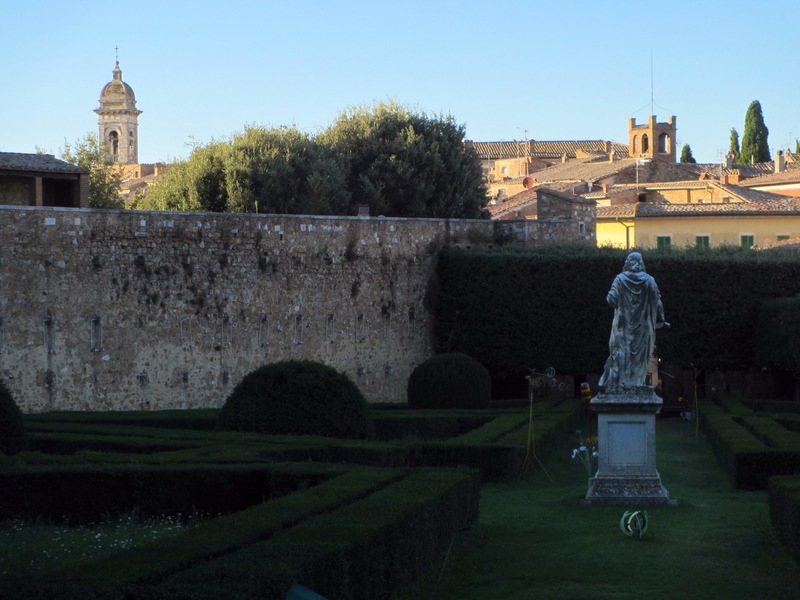 We retreated inside the walls of this ancient city and, having worked out the complex levels of the cobbled streets miraculously found our B&B. The view from our bedroom window was worth it. 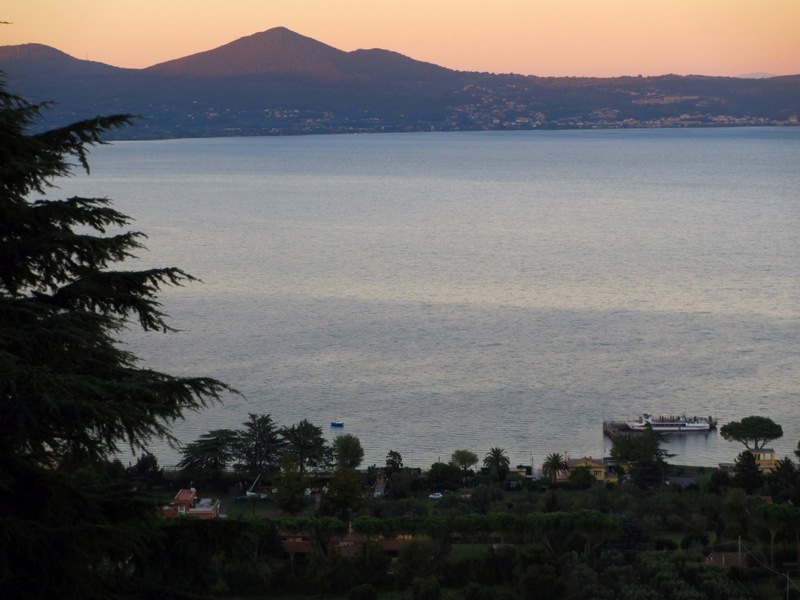 On Friday we have our last heavy duty day of climbing to another crater lake, the Lago di Bracciano. The forecast is looking good. 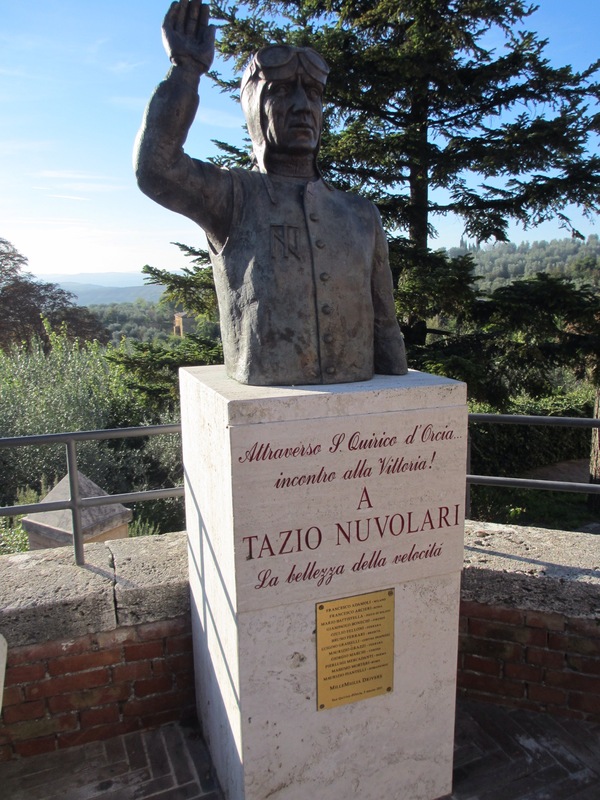 PS For our friend Ian’s benefit, you were absolutely correct that the wonderful restaurant in San Quirico was Al Vecchio Forno; we could easily have given up the journey there and then!! We got organised a bit earlier as we knew we had a hard day ahead and the forecast wasn’t good. Indeed, as we loaded our panniers onto the bikes the woman at the B&B told us that we were due to get storms at the highest point of today’s ride. The initial few miles from San Quirico were very easy and fast, but also slightly depressing as we lost height very rapidly. We must have lost more than 700 ft in the first couple of miles, only to have to climb to regain it in the next two miles and then lose it again!. Eventually the road started a determined upward trajectory towards the high point of the day: Radicofani. 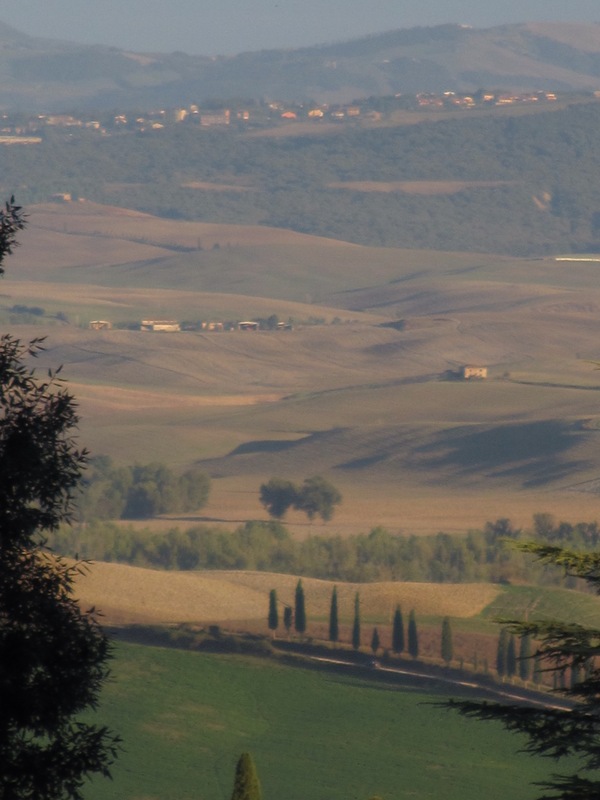 The views back to San Quirico were excellent if a little murky. 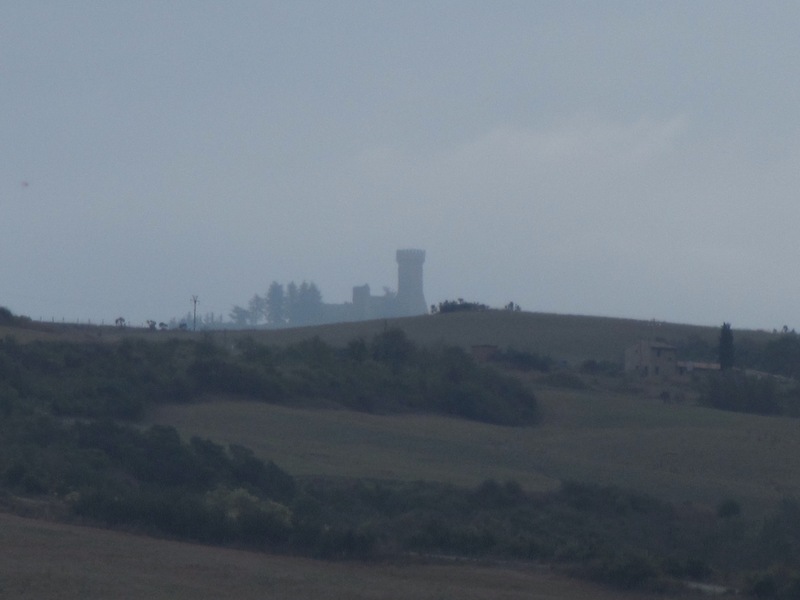 Despite the gathering gloom over Monte Amiata some holes in the cloud appeared and the light over Castiglioni d’Orcia persuaded us for a short while that the forecast might be wrong. After about 12 miles we left the Via Cassia (the main road to Rome) and set off up the 5 mile continuous climb to Radicofani. The light was beginning to fail, and the landscape developed a more menacing feel akin to the moors above Cawdor near Inverness. As we stopped for a drink and an energy bar we were tooted by a car; it was the local priest (we presumed) and another passenger. For five minutes the light improved and we thought we had escaped the weather. 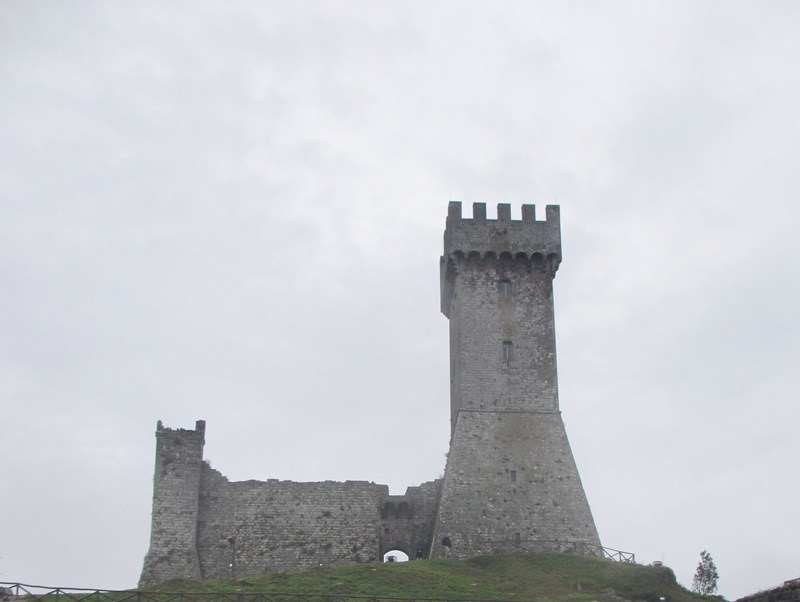 Even the castle at Radicofani now looked a little more inviting. As we approached the village the rain started in earnest and we had to don full waterproofs. 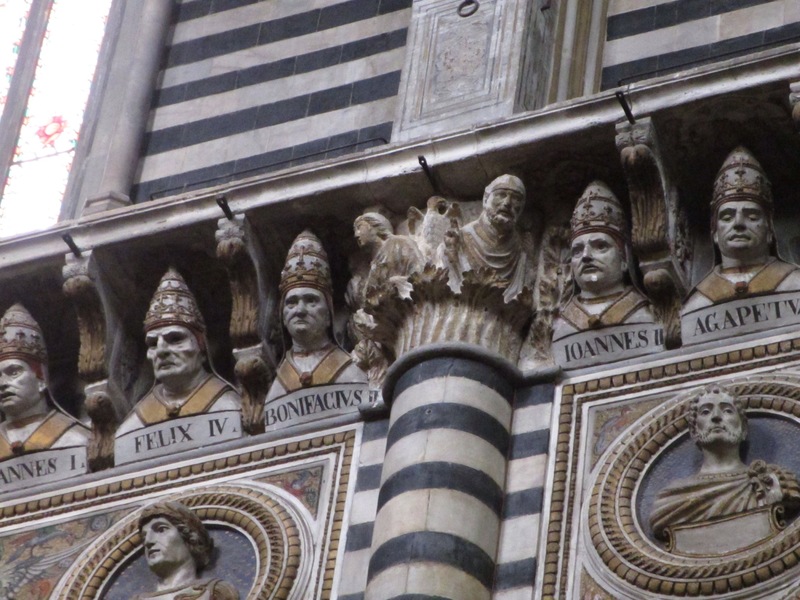 Apart from the storm out of Lucca it was the first time since before Reims. We couldn’t complain…..but we did…….a bit! The finish into the village was impossible with loaded bikes and so we pushed to the small and very historic church. 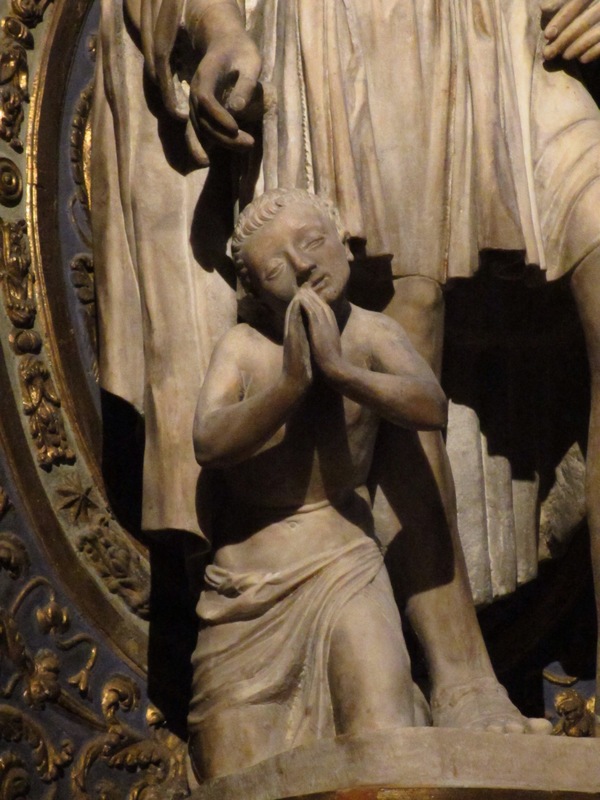 Just as we arrived the priest was coming out of the sacristy – the same one who had tooted us earlier. He was very pleased to see us, and was also very proud of his church. It proved to have a rich collection of treasures. 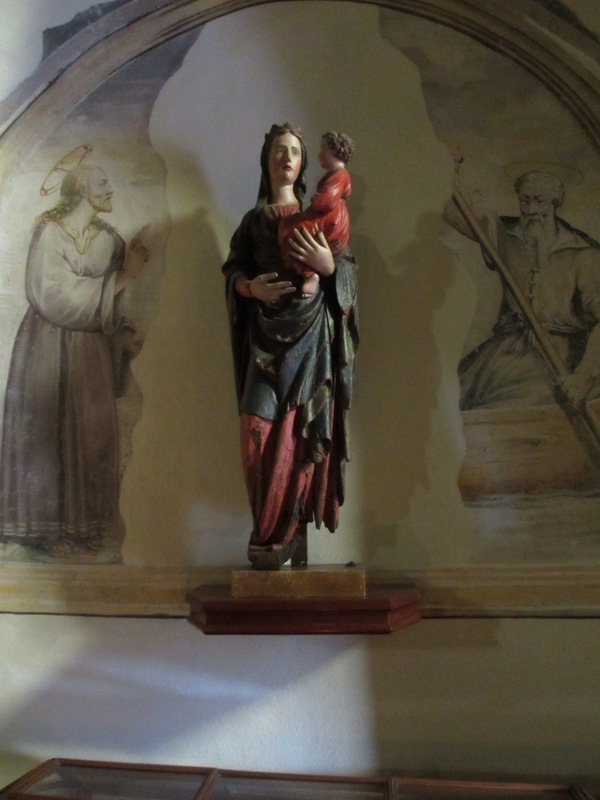 This polychrome wood madonna dates back to 1411. 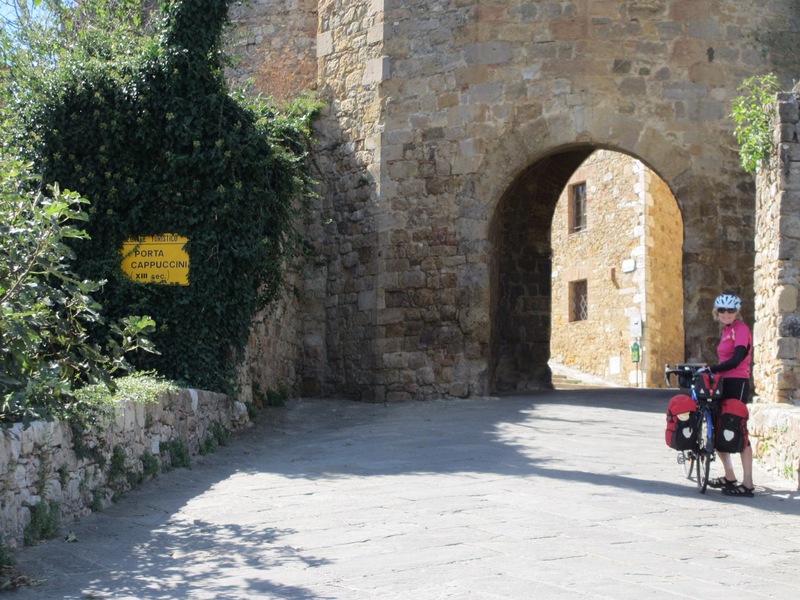 Linda looked after the bikes whilst I took to the footpath for the final 100 m pull up to the castle on the Rocca. It felt like a film set for Macbeth. We sheltered from the rain in a closed ristorante which nonetheless gave us a coffee to warm us up, and then we embarked upon losing the 500m or so we had gained by going up to Radicofani. 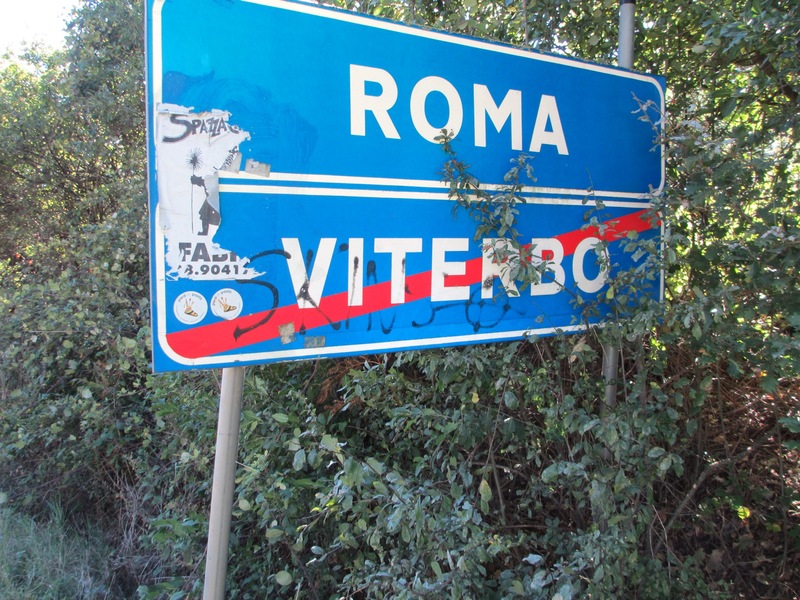 As we left the village the road sign indicated that the distance to Rome was just below 100 miles. It was a special moment for us. The road took a looping, serpentine route back to the Via Cassia which would have been exhilarating had it been dry. As it was we exercised great care not to lose control of our loaded bikes on the many hairpins. 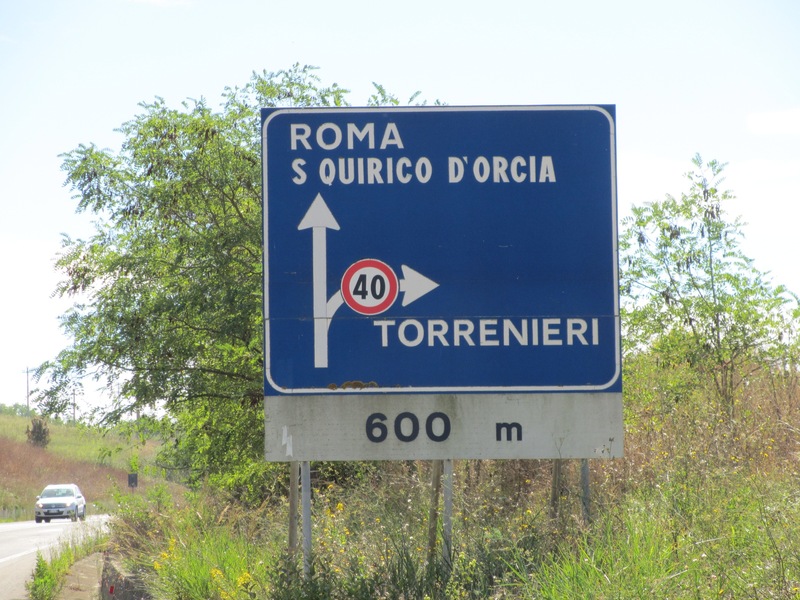 We re-joined the main road to Rome which, in this remote country, is almost free of traffic, and made good progress towards Acquapendente. Another sign brought a smile. We crossed a small stream and left Tuscany for the final region, Lazio. This was a day of major waymarks. As with all towns in this part of Italy, Acquapendente sits on top of a hill and so we had a steep finish. 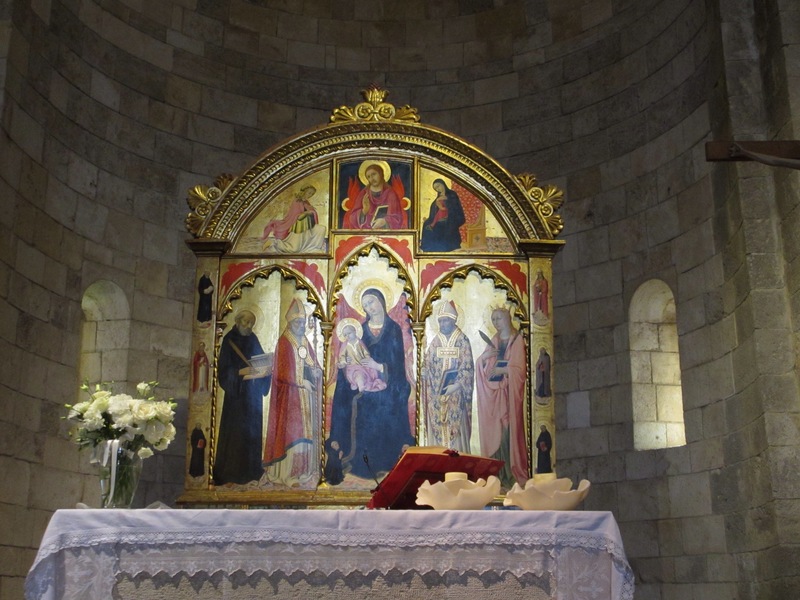 We sought out the Basilica of the Holy Sepulchre which dates back to the 10th century and has a remarkable crypt despite the church having been all but destroyed by allied bombing in the Second World War. 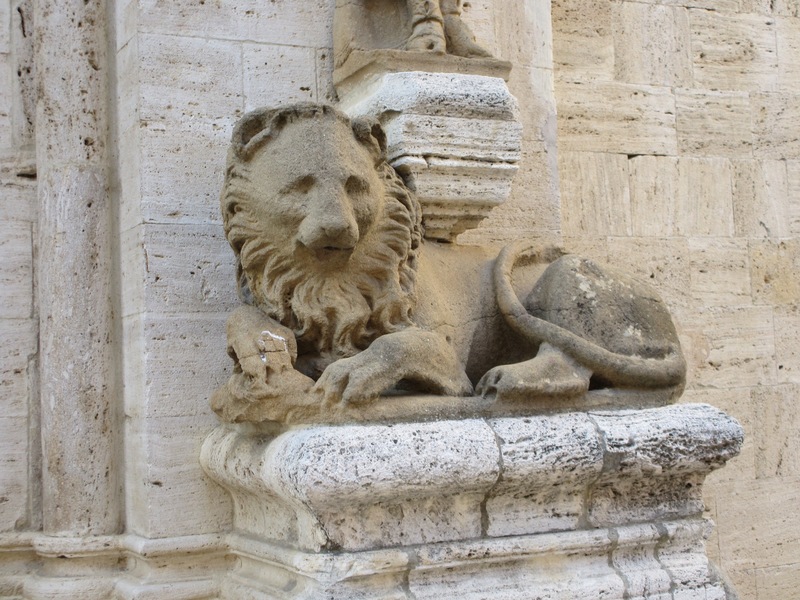 The capitals in the crypt have wonderfully preserved images of animals! We had had some trouble finding accommodation in the town and so had booked a B&B just ouside. It proved elusive to find but well worth the effort. We had climbed another 1000 m, and lost almost as much. Tuscan cloud is much like Scotch mist, but at least we didn’t get the storm. 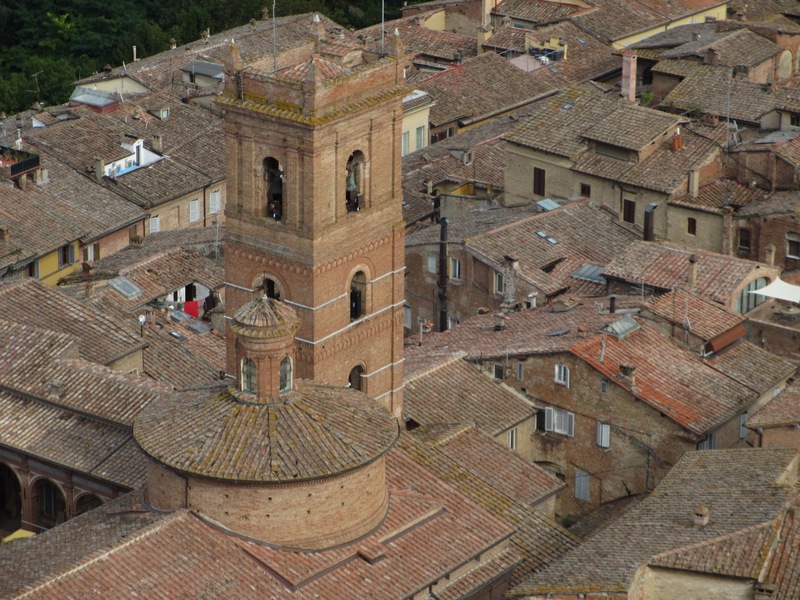 We worked our way out of Siena (which has a very complex road layout due to the multiple levels and complex hill structure) by searching out the Via Roma and the Porta Romana. It worked a treat and soon we had our first clear confirmation that our ultimate object was getting closer. Although we had to follow the main road for almost the whole journey the riding was very good and took us into relatively remote Tuscan back country. 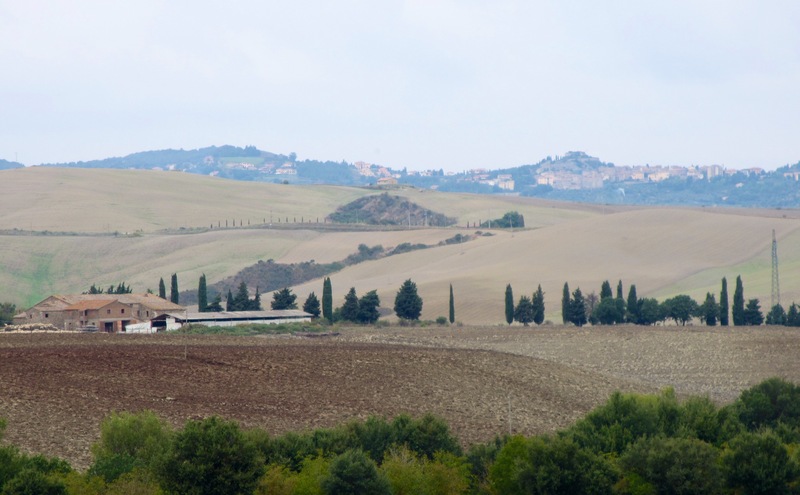 We crossed several rivers and eventually reached the Val d’Orcia. 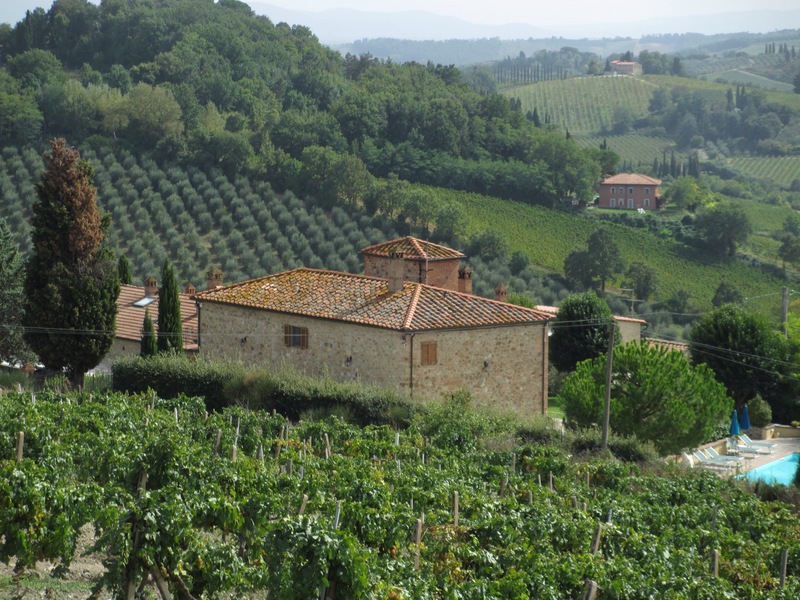 Most of the climbing was reserved for the end of the ride as San Quirico d’Orcia sits right on top of a high ridge across the valley from the renowned Montalcino. 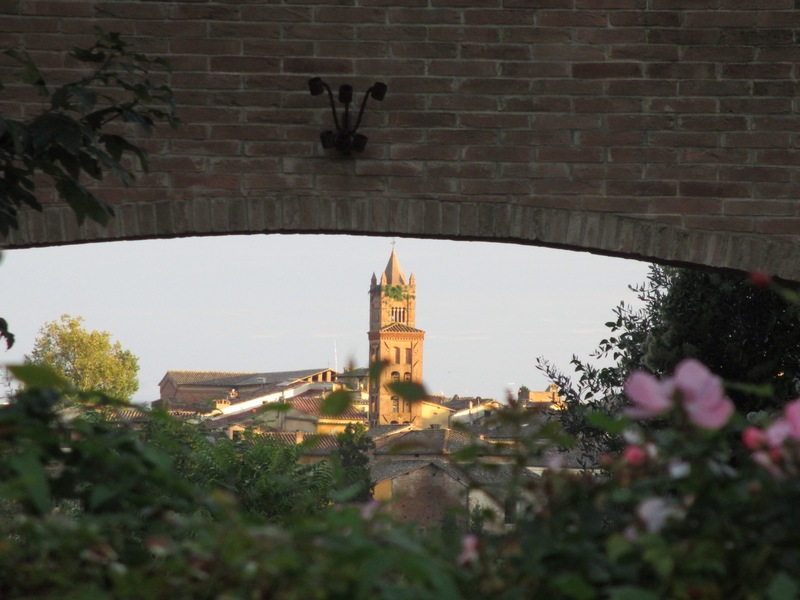 We entered this ancient town through the gate of the Capuchins. 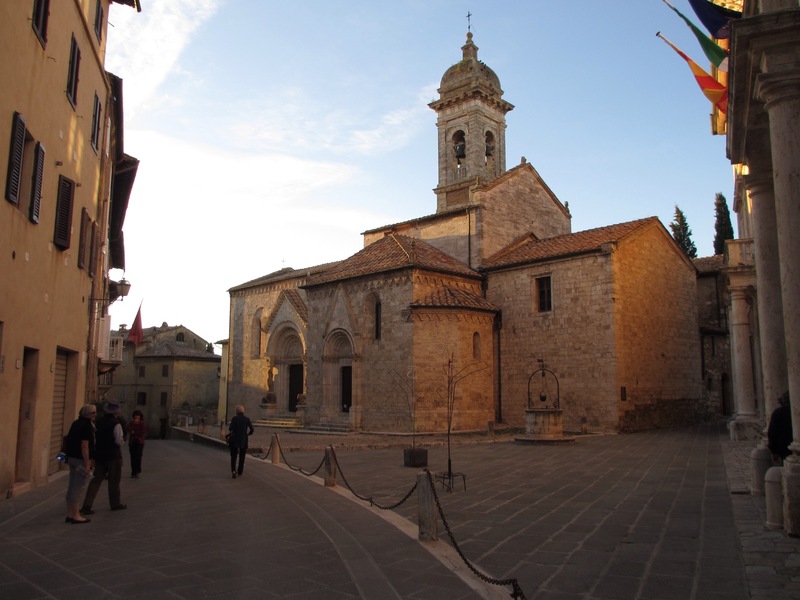 San Quirico is at a major crossroads of the Via Francigena going south to Rome, and the east-west mediaeval artery taking goods from the Aegean to the Mediterranean. 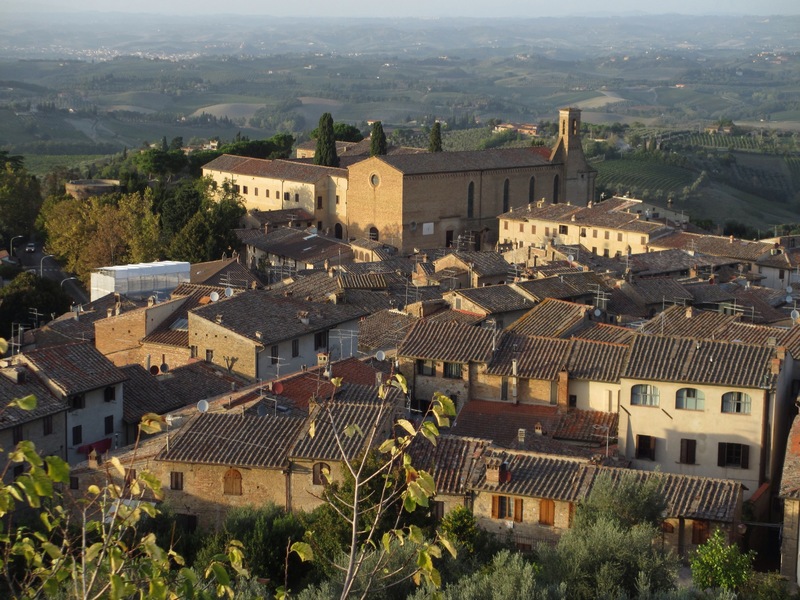 It is a beautifully preserved village/town which has been re-generated in recent years by tourism and interest in the Via Francigena itself. 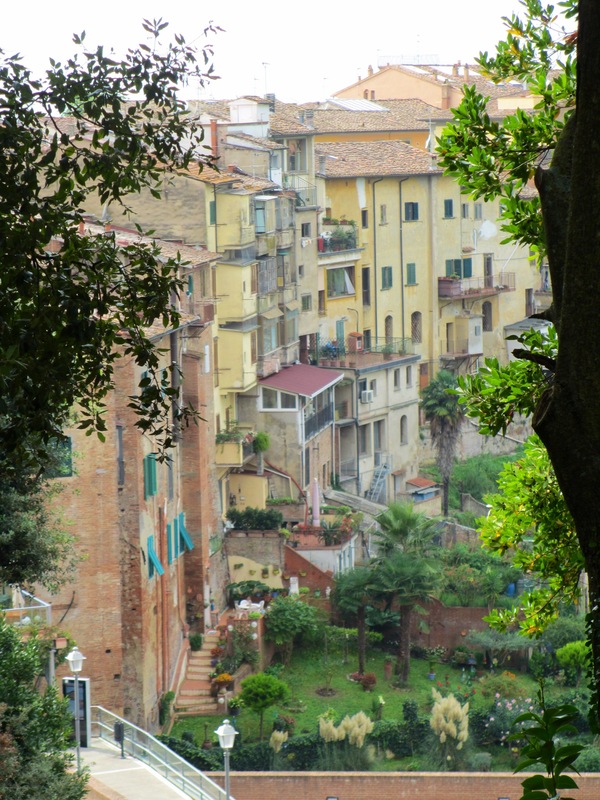 We arrived in time for lunch in a picture perfect Trattoria complete with a hidden garden. The highlight of the lunch, apart from the food, was a wonderful waiter who spoke excellent English and was a dedicated road cyclist. He was very excited by our project but above all he gave us brilliant advice on the very hard day to come tomorrow. He suggested an alternative route via Radicofani as the gradients are slightly kinder and the views better. We have now re-planned tomorrow! We had plenty of time then to wander the streets of this special place, having deposited our bikes in the lovely garden of our B&B. 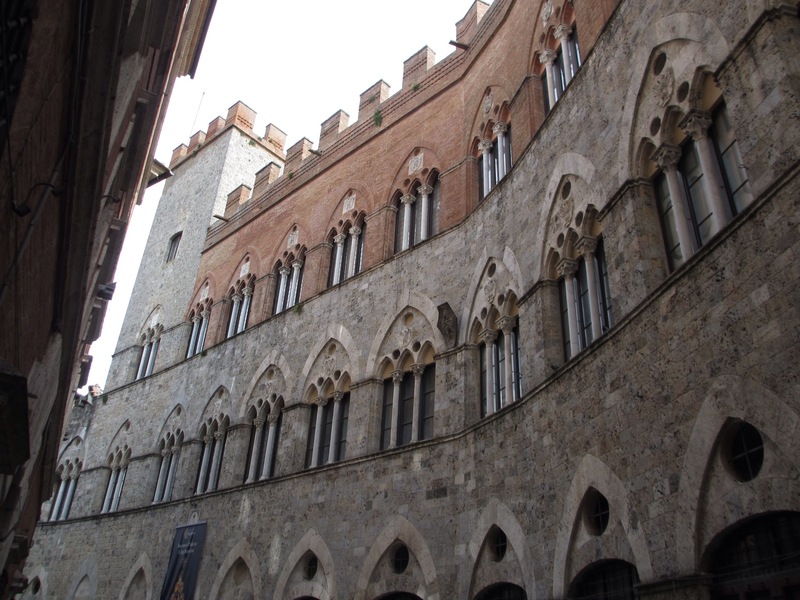 San Quirico is very proud that it is on the Millemiglia route! 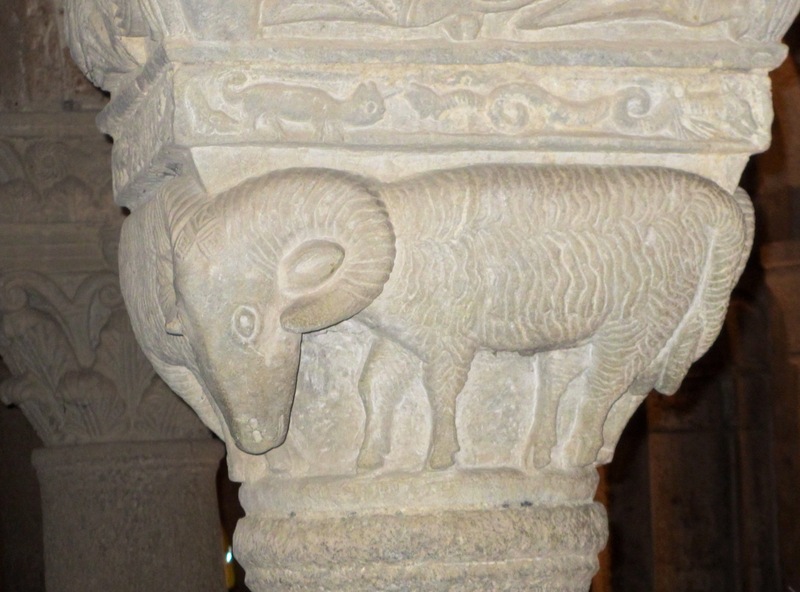 The Romanesque church of Santa Maria is strong on animal symbols; this one has back-ache! We enjoyed our lunch so much we returned for our supper. Tomorrow (Wednesday) we head back into the high hills for the last time before Rome. We hope it stays dry. The arrival of the equinox seemed to bring a change in the weather. 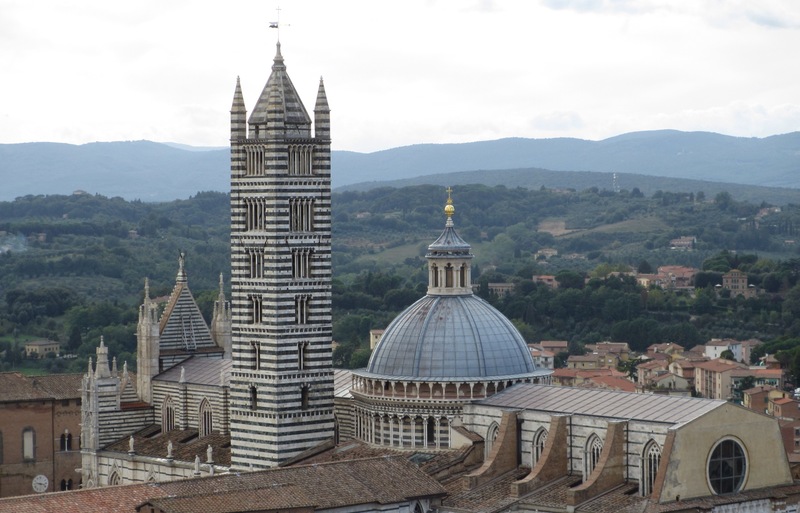 The cloud was skimming the tops of the buildings in Siena and the Duomo was shrouded in mist. At this early morning stage it didn’t matter too much as we had to catch up on the washing; a cycle tourist’s life is not all junketing! 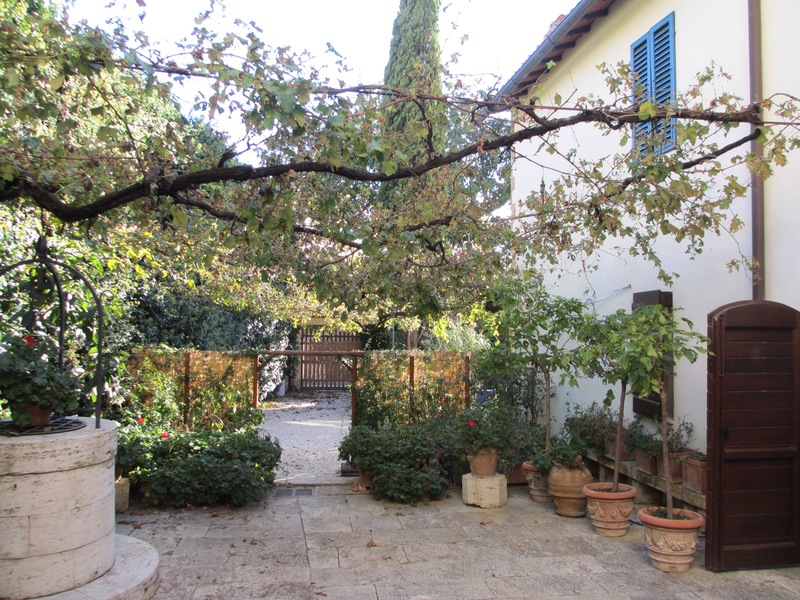 We explored rarely visited parts of Siena’s back-streets and found an excellent lavanderia with branches in Rome. Linda photographed the board for future reference! There is an anthropological PhD study on the sub-culture of Italian Lavanderias just crying out to be tackled. 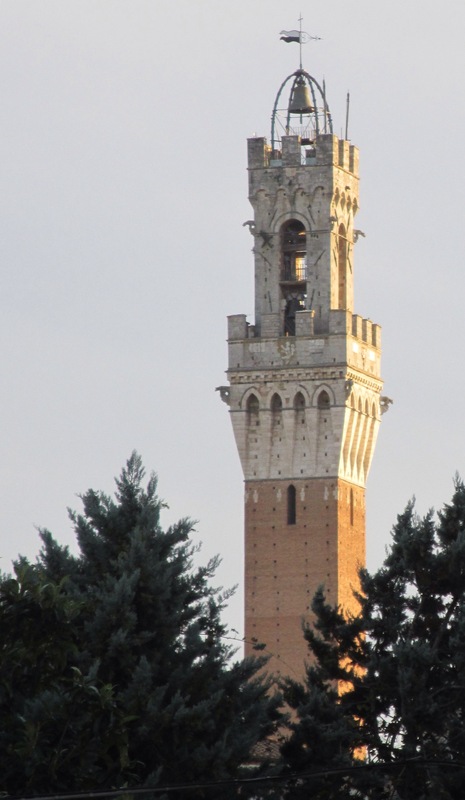 But enough of that: the washing was spun and delivered back to our B&B to be air dried and so we set off for our one day tour of Siena. There is a huge amount to see in this magical place. What follows is a few photo impressions. For those who have been we hope they evoke memories, and for those who haven’t perhaps they will fire the urge to visit. The night before we set off from home our newsletter at church included the quotation from St Catherine of Siena given at the top of this post. 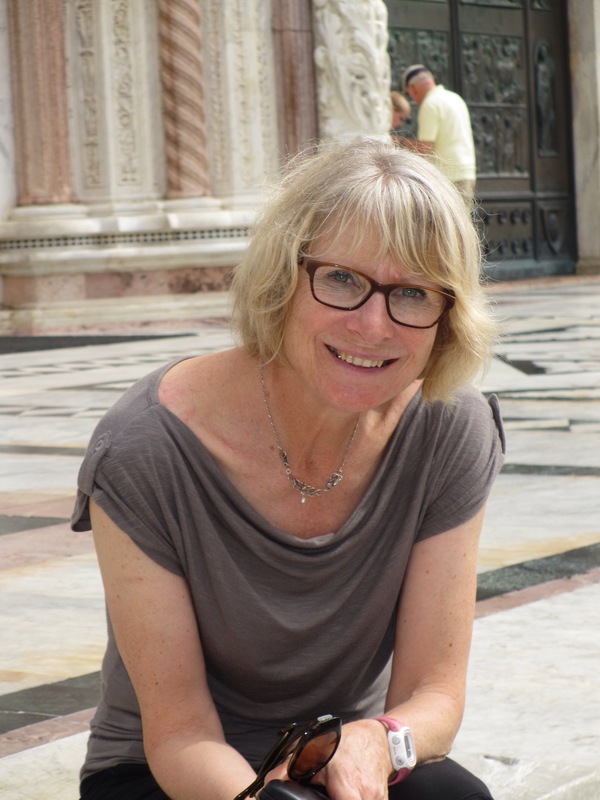 We think she must have known something about the Via Francigena. 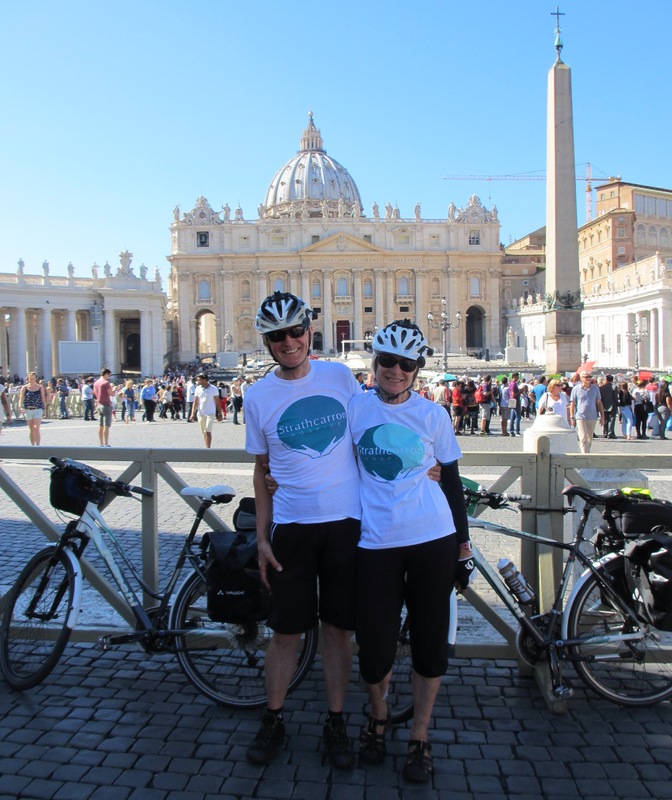 On Tuesday we get back on our bikes for the final five days’ riding to Rome. Our friends, Pat and Roger, have asked that we cycle slowly so that the photo blog may continue. 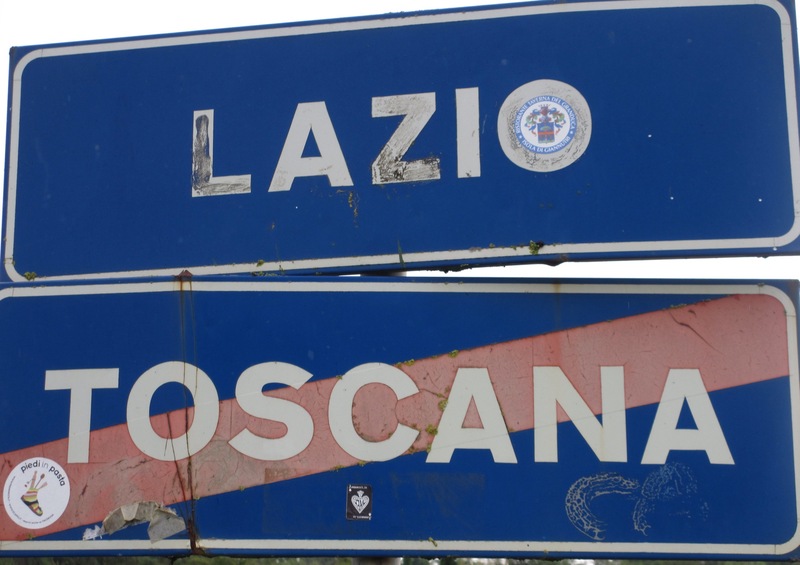 We can assure them that the cycling will be very slow as we have to climb back into the Appenines before we enter Lazio. Our walking guide book describes the next few days as very strenuous. Hm! 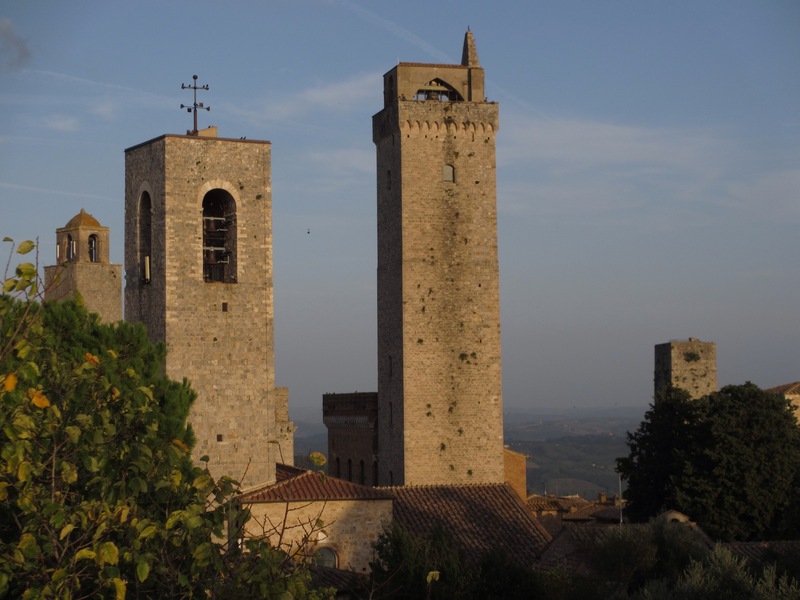 To our surprise, although our hotel was very near the summit of San Gimignano, the first half mile or so of the way to Siena took us uphill. It was hard on cold muscles.The good news was that we were then treated to a very long, well-graded descent through a Tuscan morning which had the feel of the first day of autumn. The masses of cobwebs on the vines were silvered with the early morning dew. 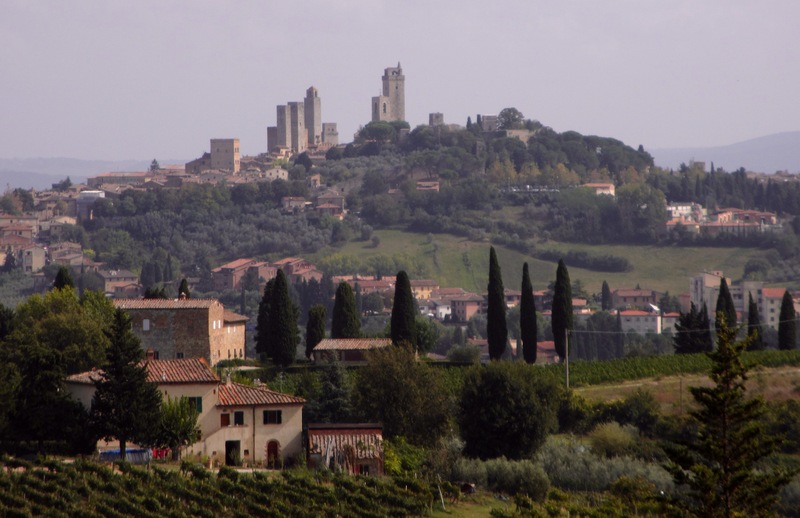 As this was Tuscany our enjoyable descent was soon reversed and after some sustained climbing we were treated to a view of San Gimignano from the east. The gradients were kinder than previously and Colle di Val d’Elsa seemed to appear without the strenuous effort of the day before. 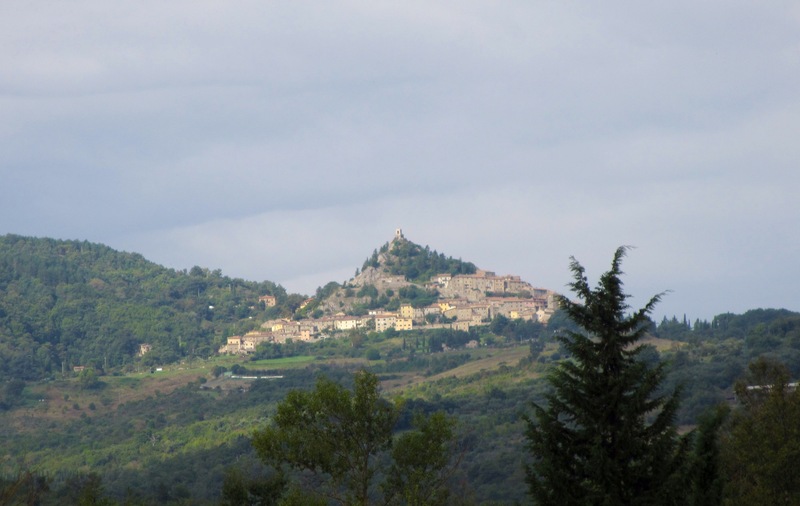 We regretted that we didn’t have time properly to visit Colle as it has much to see but we knew we had another long climb to get to Abbadia Isola which was on Sigeric’s route (you remember Sigeric?). It was in a tranquil and remote setting, and had a pilgrim hospice attached . The guardian was enormously pleased to see us, especially as we had come all the way from Canterbury. He offered us drinks, showers, etc. 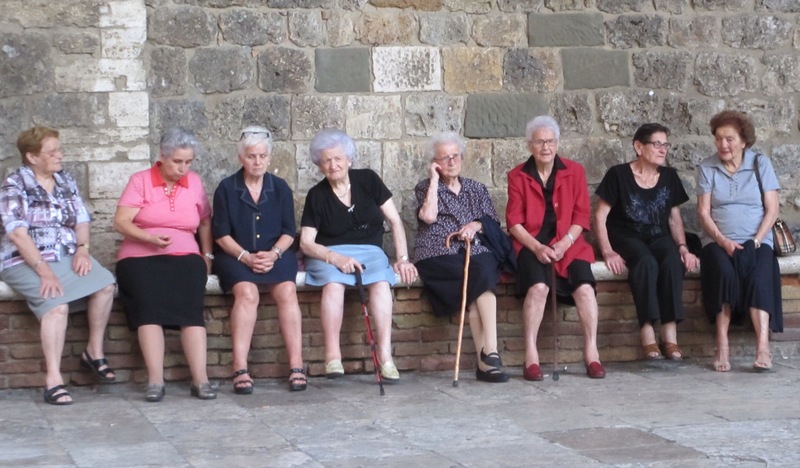 I think we must have looked hot, but we explained that we were hoping to get to Siena that day. 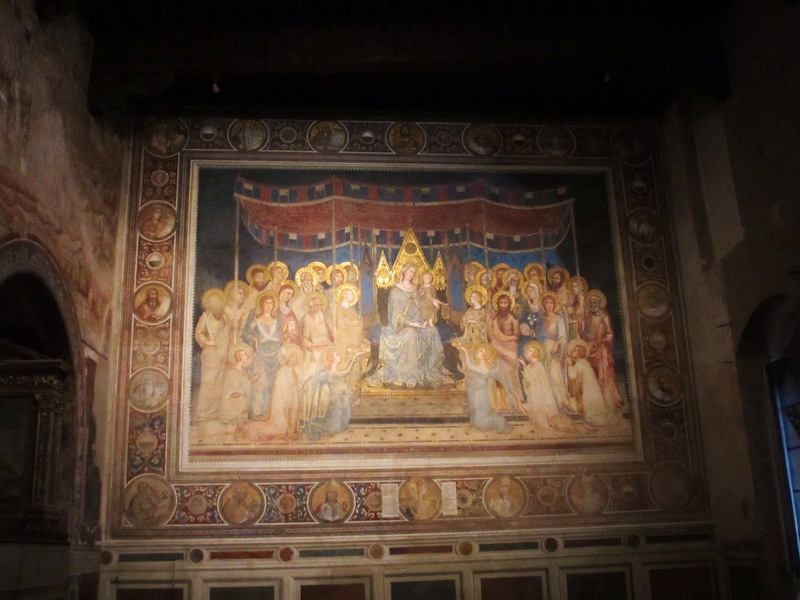 The ancient abbey was a lovely church and much more peaceful than those of San Gimignano. 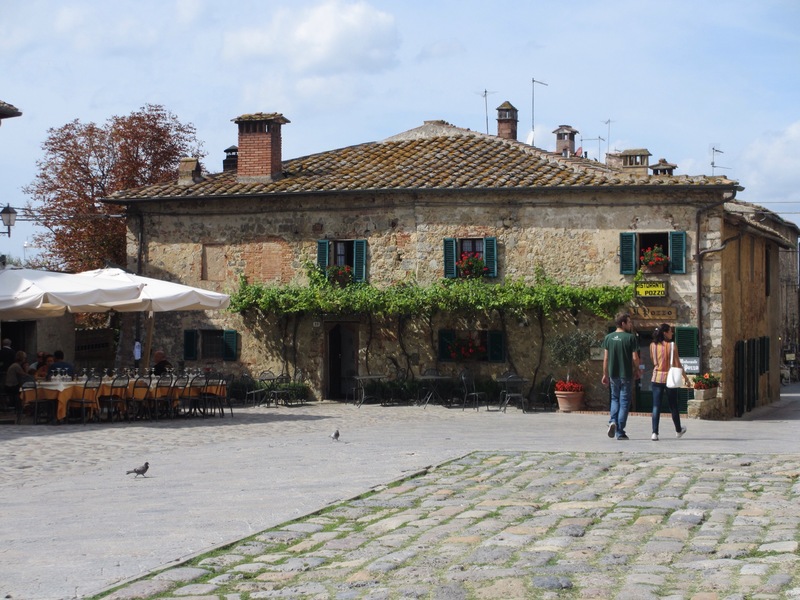 It was not far from the Abbadia to Monteriggioni where we hoped to get lunch. 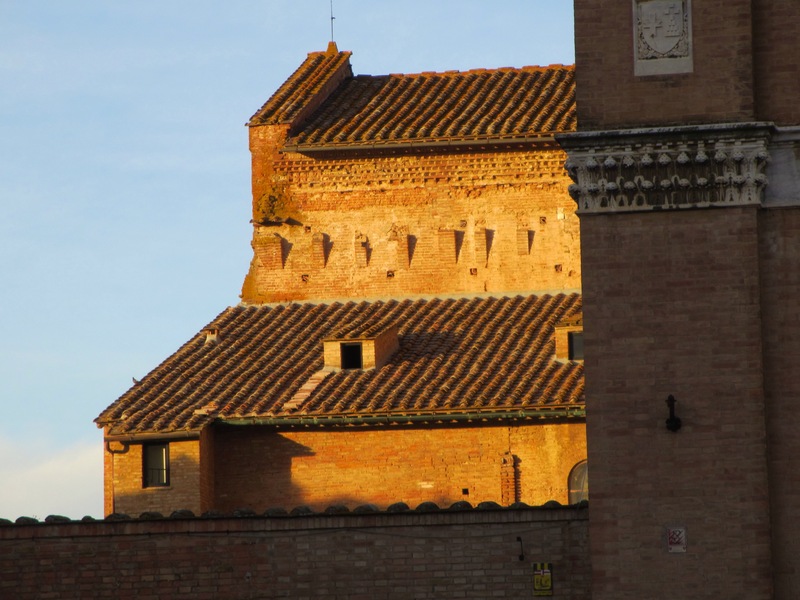 There were vaguely mutinous noises coming from behind me as we turned off the road to Siena to climb into this walled and castellated town, but they ceased once we passed through the gate! 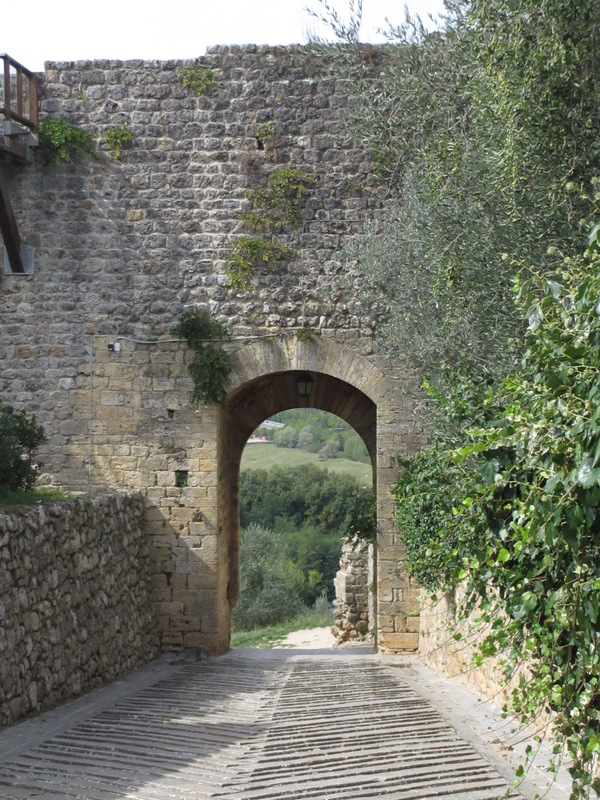 The old pilgrim gate for the Via Francigena really gave a sense of what it must have felt like when the mediaeval pilgrim entered the relative safety of Monteriggioni’s walls. A delicatessen specialising in Tuscan foods produced a vast platter of cured meats, cheeses and bread for our lunch which we quickly devoured. 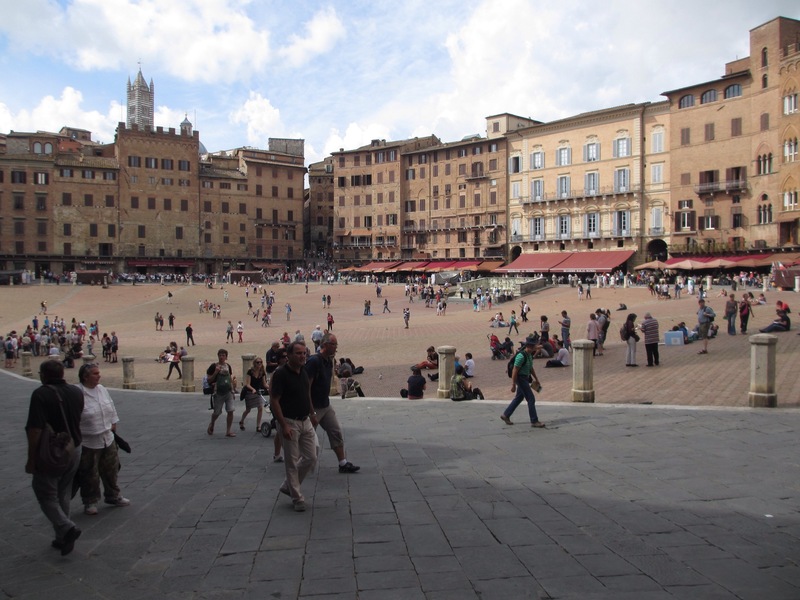 We then took to the road again for the final stage into Siena. 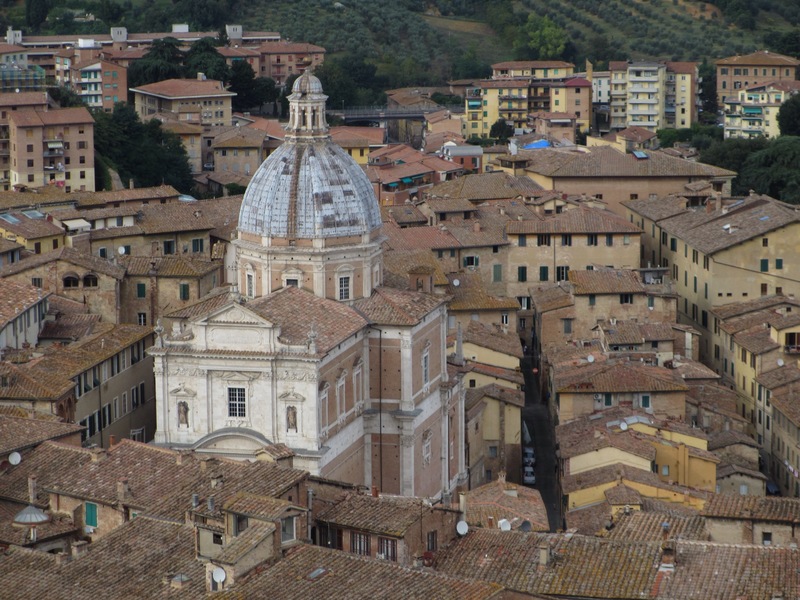 It would be fascinating to see the topography of Siena before it was built as route finding in the complex maze of streets was a challenge. The roads are all at different levels and, at one point, the GPS wanted us to climb a set of stairs! After one or two false leads we found our B&B right in the heart of the old city and were offered ideal accommodation for our four bikes. We were glad we hadn’t arrived by car! 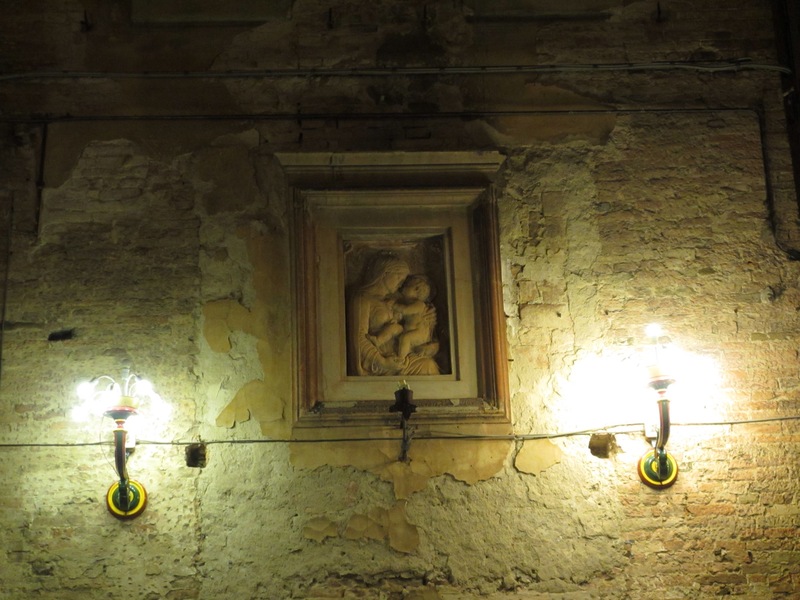 Our host at the B&B explained that our building was an old convent dating back to the 15th century. 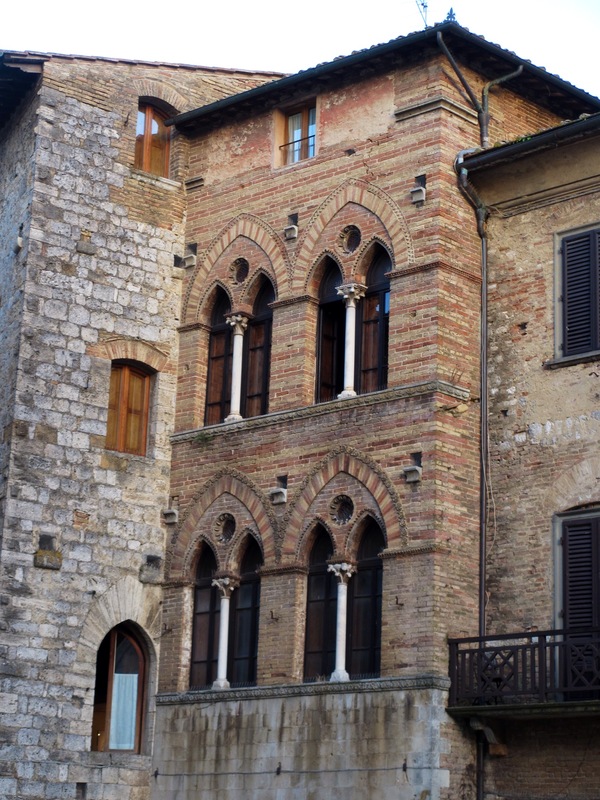 He had been born in the building which fronts on to the Via del Paradiso. We joked that he had been born in paradise. Our brief walk before supper seemed to confirm our surmise. Tomorrow we hope to find out a little more of what this celebrated city has to offer. For tonight a couple of nocturnal studies of our street will suffice. Our B&B in Ponte a Elsa was run by a retired policeman who was an ardent pilgrim. 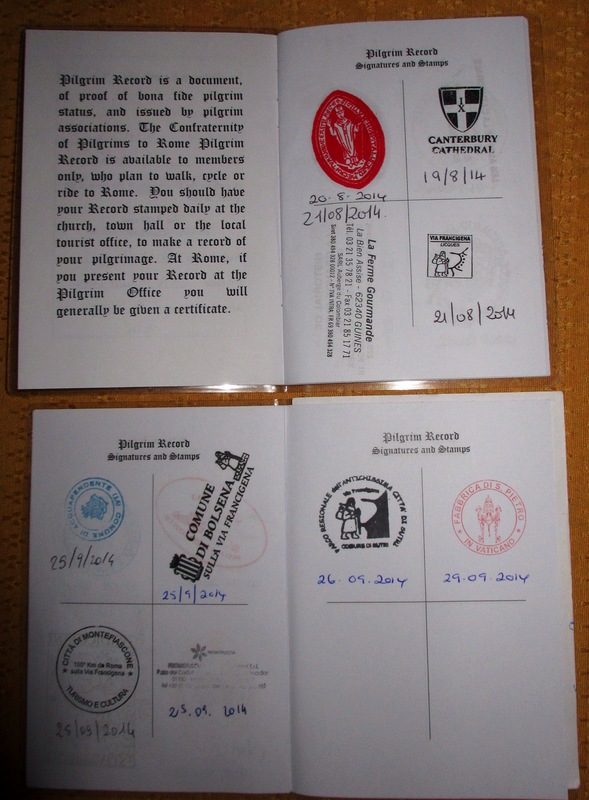 He had walked the Camino from St Jean Pied de Port to Santiago twice and also the Via Francigena ( a section of the Italian part) and so he was very pleased to receive a group of pilgrims. We were treated to a superb family meal, and on departure he wanted a group photo! 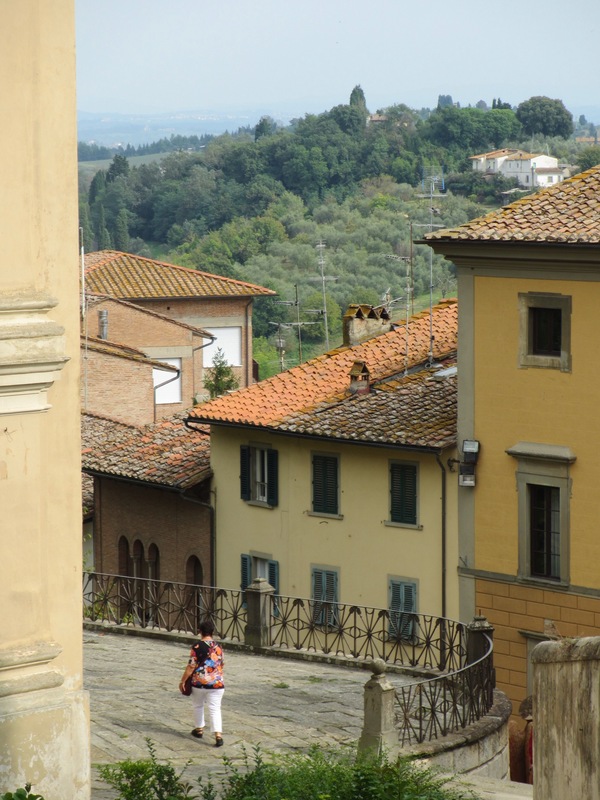 The initial part of the route climbed steadily out of the village and provided a panoramic view of San Miniato. 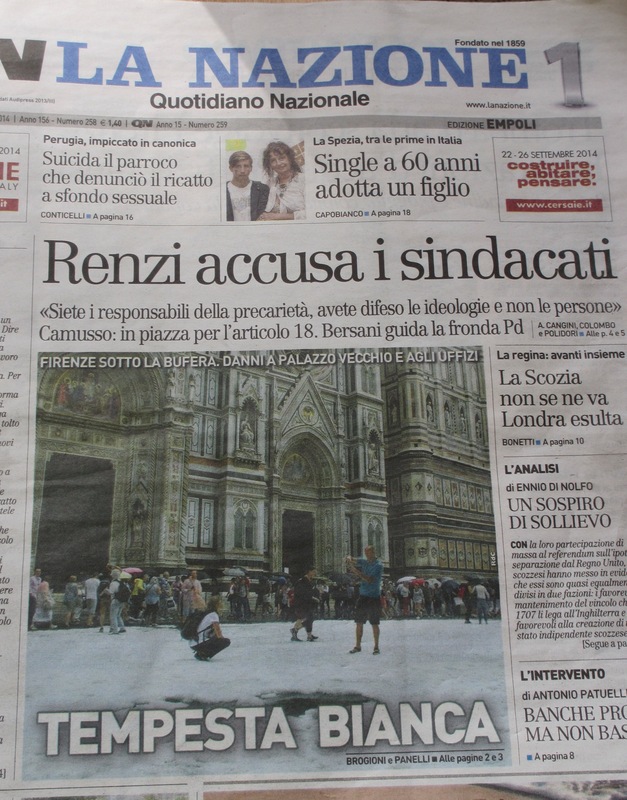 We stopped in a cafe in Castelfiorentino and noticed the headline in the local newspaper. 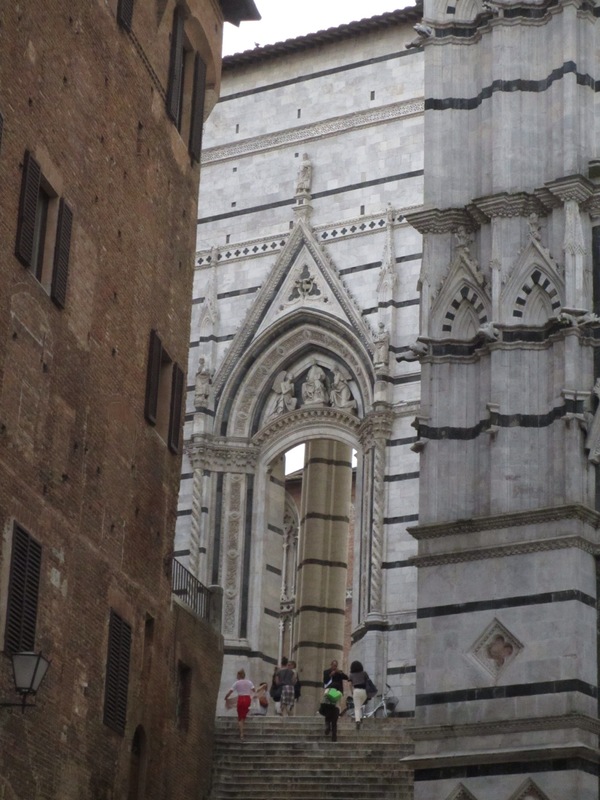 Our B&B owner had been right about the severity of the storm: the photo is of the piazza in front of Florence’s Duomo under a few inches of hailstones! After Castelfiorentino we started the very long climb into the hills towards Gambassi Terme. The heat was intense and the hills undoubtedly the hardest we had experienced since climbing the Passo della Cisa. The combination of the heat and the sustained gradients made for a very demanding ride; it was much harder than we expected and was a tough day for Roy and Sarah as it was only their second day out from Lucca. The countryside views were some compensation. Eventually, and a long way beyond Gambassi Terme, the gradient began to ease and we began a gradual descent towards San Gimignano. 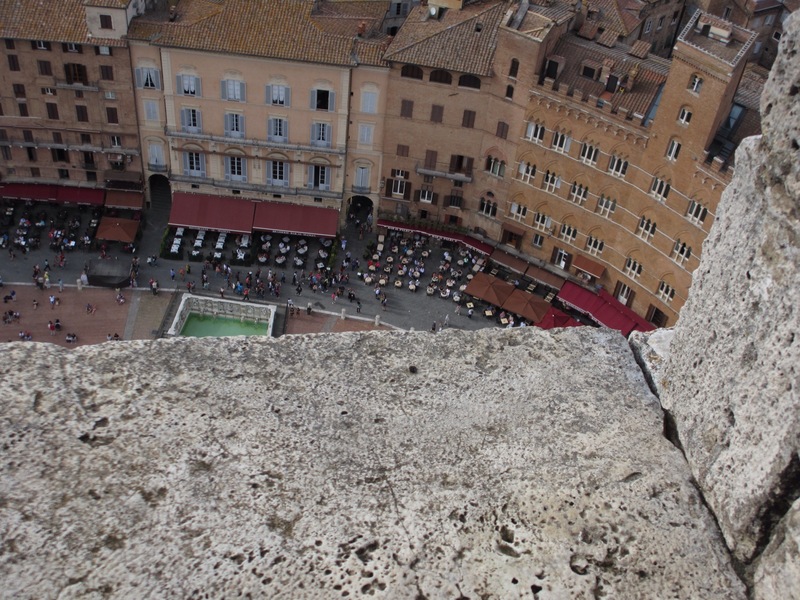 The first view of this celebrated city from high above was stunning. As the observant among you (especially those who cycle!) will notice the road descended to below the city and thus we were left with a steep ascent into the old city. The final section is busy with tour buses, one of which took the line so close that it forced me off the road. Fortunately, I was able to come off onto a steep bank on the side. I subsequently discovered that Linda had suffered almost as badly at the hands of the same bus driver. 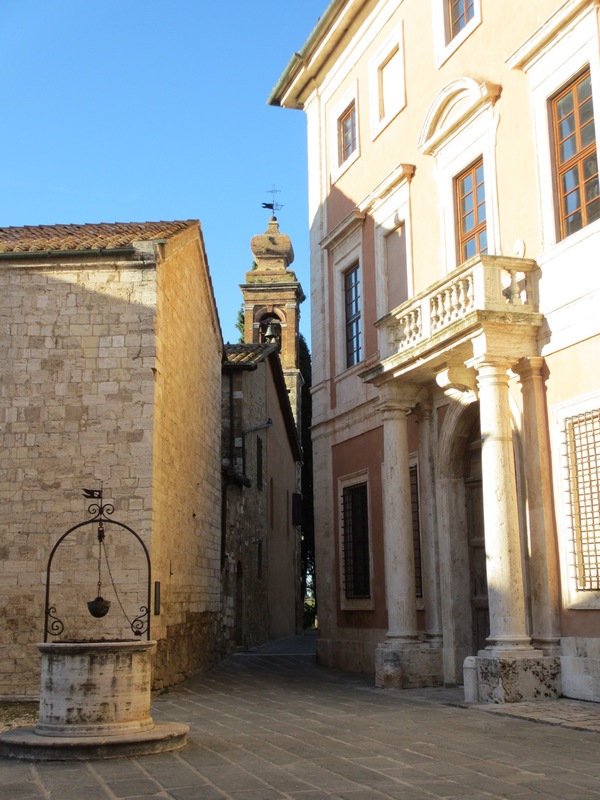 Eventually we arrived at the gate into the city and were pleased that our hotel, built around a fifteenth century well, was close at hand. Having showered off the day’s grime we were able to enjoy the city in the warm evening light. Sadly we were a little too late to enjoy some of the interior gems of the wonderful place, but the stroll through its streets was compensation enough. 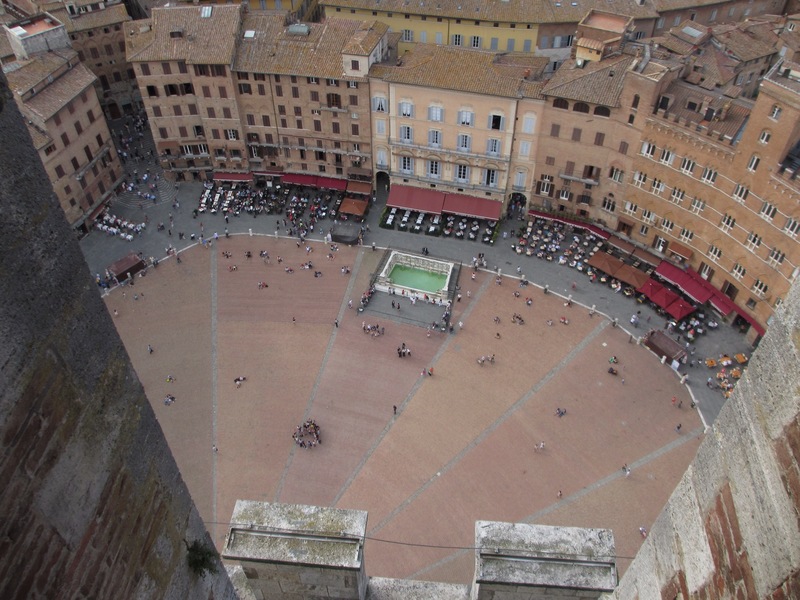 Tomorrow (Sunday) we continue to Siena where we have a rest day. 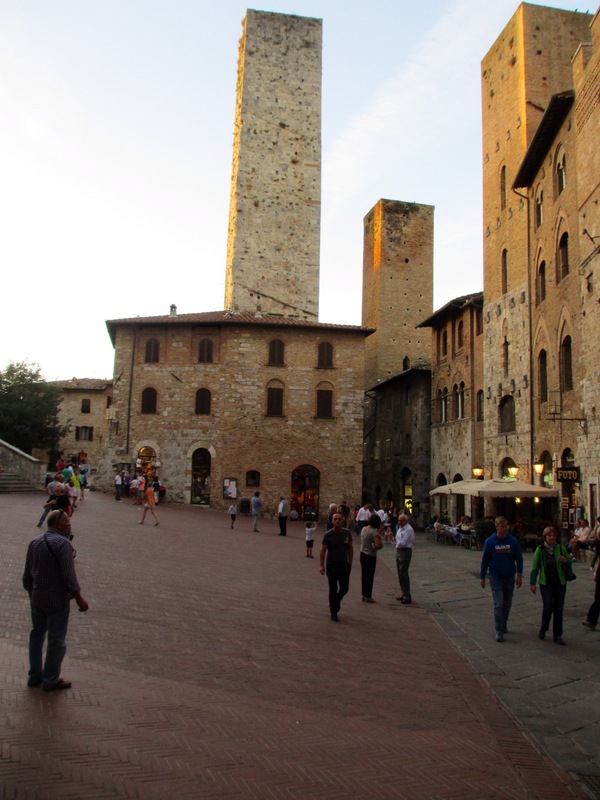 I’ll close with a few glimpses of San Gimignano in the gloaming. We woke to the tremendous news (from our perspective) coming through our BBC app on the iPad that we were to remain part of the United Kingdom. In truth we were up in the middle of the night checking for updates. 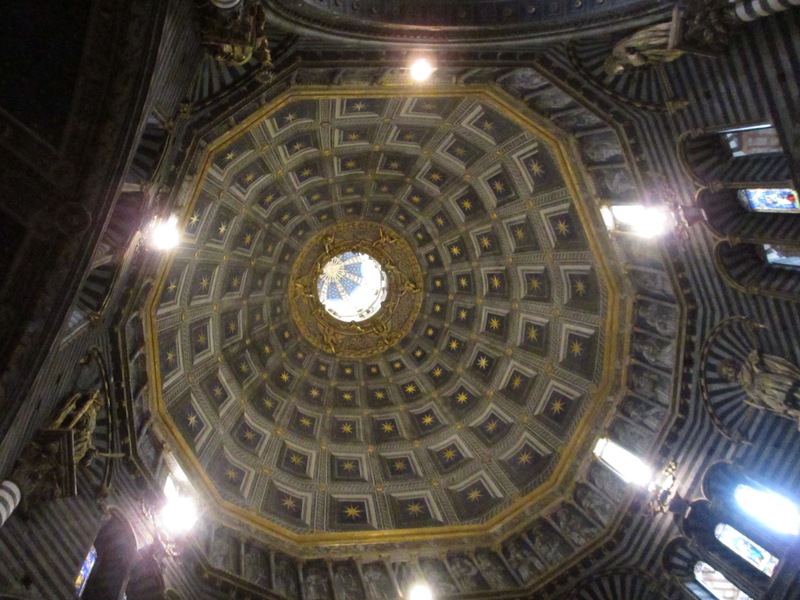 We set off from Lucca with lighter hearts, although the weather and the sky could not have been heavier. This was Roy and Sarah’s first day in the saddle and it was a tough start for them. The weather was very sultry and uncomfortable for riding and the route stayed with the heavy traffic all the way to our coffee stop in Altopascio. 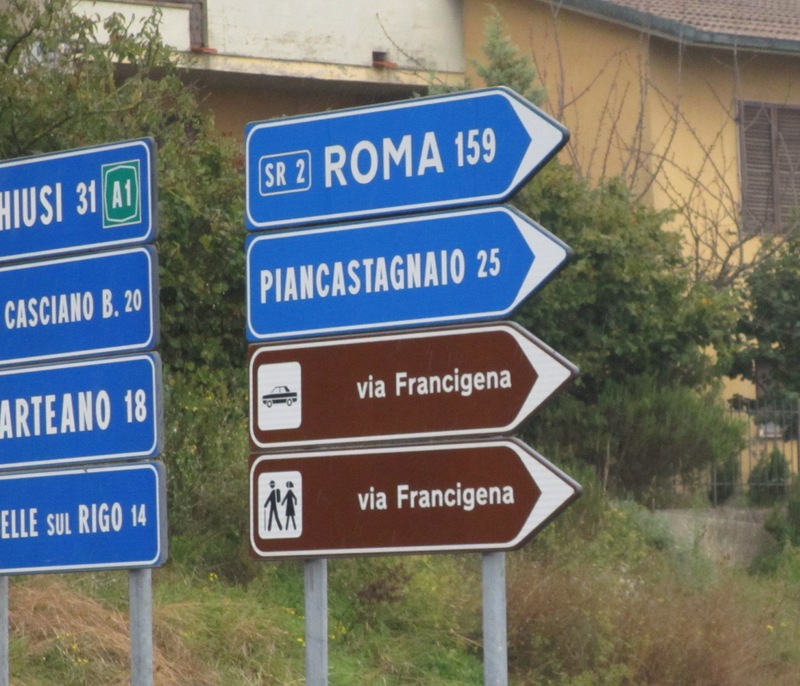 This small town is important in the history of the Via Francigena and it had a great deal of signage and interpretation boards to provide insights into the significance of the route. 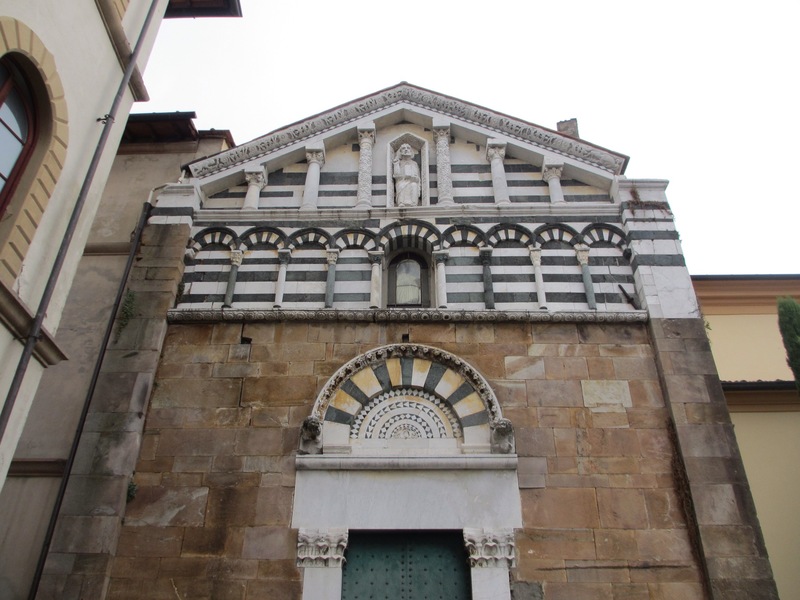 The facade of the Chiesa di San Jacopo dates back partly to the end of the eleventh century although the church has now been incorporated as an apse into a more modern church. 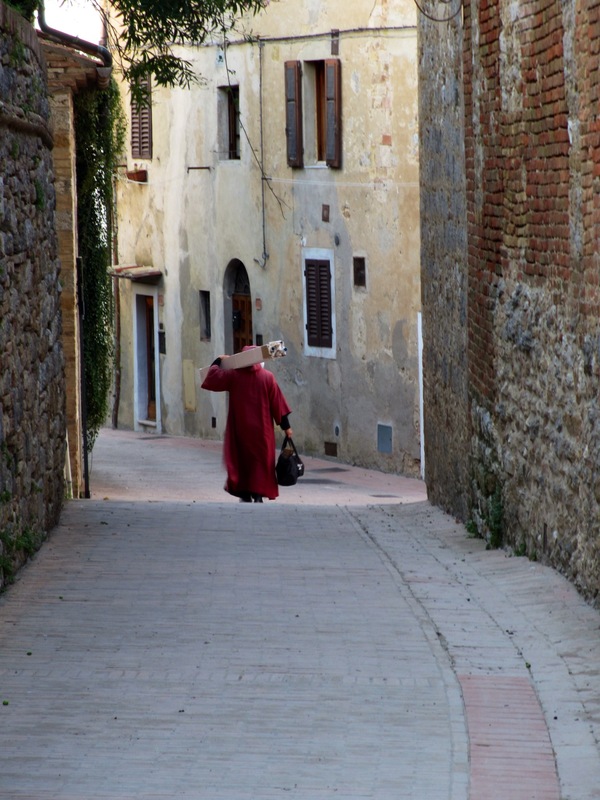 We took a quieter way from Altopascio and the landscape quickly became recognisably Tuscan. The lowering clouds which had accompanied us from Lucca now developed a truly menacing appearance and it was as if night were about to descend. As we were approaching Fucecchio the thunder started and the wind developed strength rapidly. We tried to outrun the storm and get some shelter, but it quickly engulfed us just as we tried to get to shelter in Fucecchio. We got our jackets on and sheltered under a low tree but the wind was immensely strong and we held on to the branches of the tree to stop them knocking us over. We decided to abandon the ‘shelter’ and try to find somewhere to shelter and eat an early lunch. A local cafe came up trumps and were much amused to receive four British cyclists who were like drowned rats. The water was sloshing in our shoes. It was a good call as the weather became even more tempestuous. 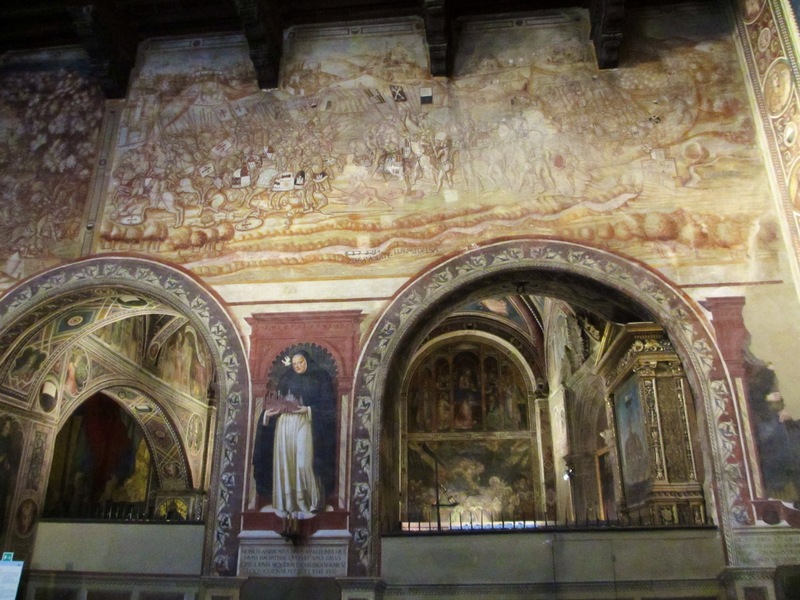 Eventually, the storm passed, we were fed and watered and so we set off for the hilltop town of San Miniato. This quiet place houses numerous architectural and other treasures and the sun started to reappear as we climbed into the cathedral square. 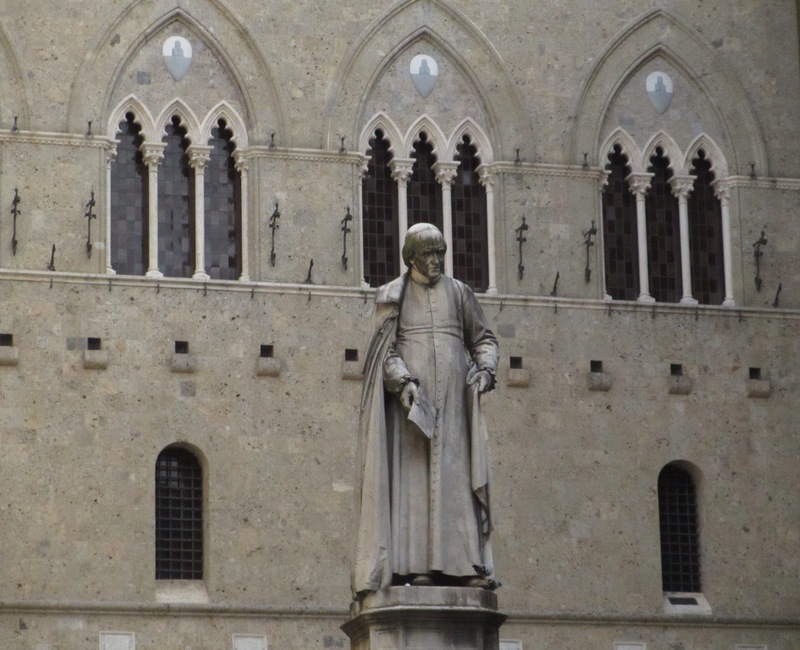 We sought out the Convento di San Francesco to get our pilgrim passport stamped and a huge door was carefully unlocked and a very suspicious friar seemed to think we wanted to sleep the night there! Eventually we managed to explain and we were duly admitted and again experienced surprise that we had come from England. Most Italians walking the Via start in Montgenevre on the French-Italian border. 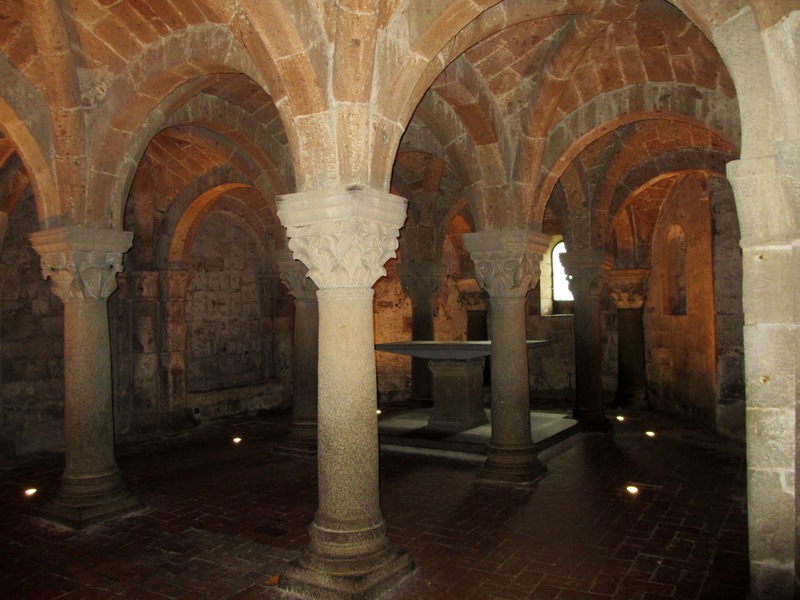 The Convento church was also interesting in its layout as it led into active cloisters and was clearly a living monastic building. 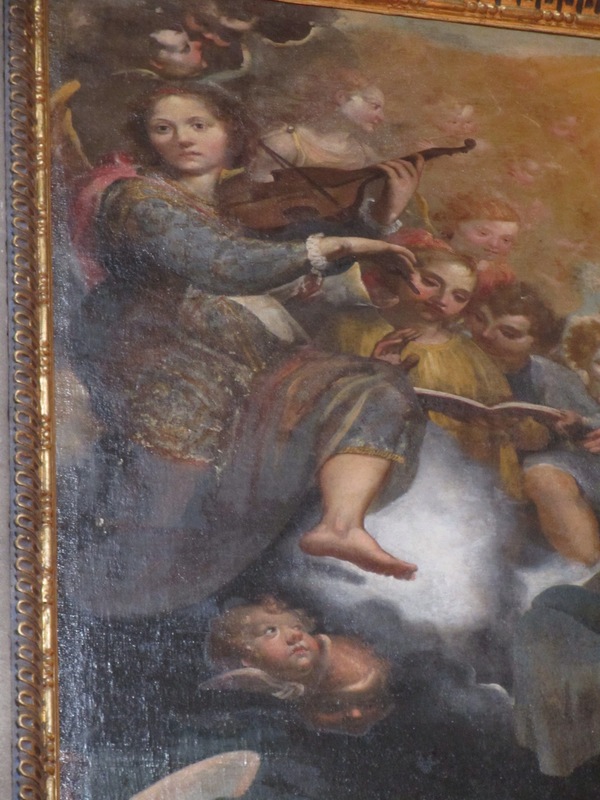 One of the heavenly throng in one painting looked as though she enjoyed playing ceilidh music! 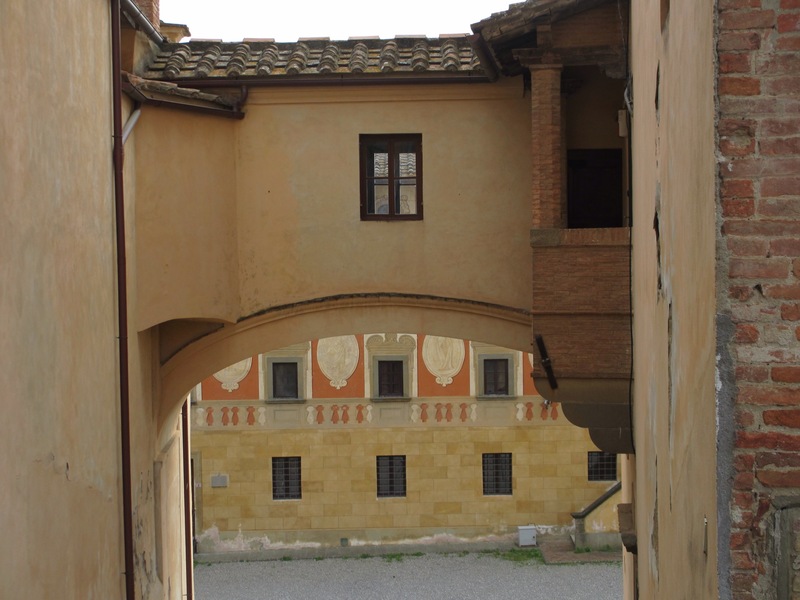 We made a very swift exit fromSan Miniato (it is on a very steep hill) to find our B&B. The owners, Benito and Mara, explained that the storm we had been caught in had caused twenty people to be admitted to hospital in nearby Florence, many of them injured by huge hailstones. We were glad of our cafe. 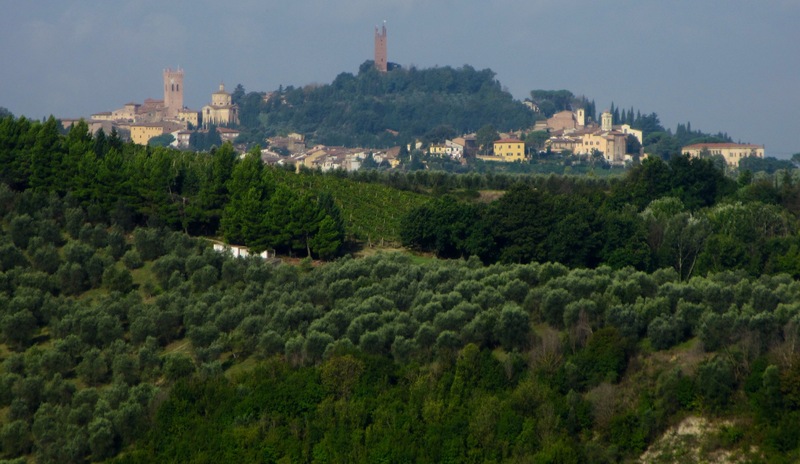 More storms are predicted for our ride to San Gimignano on Saturday! We had enjoyed the company of Roy and Sarah on this final stage of our journey. It is definitely Better Together or, as we like to think of ourselves, Team GB!